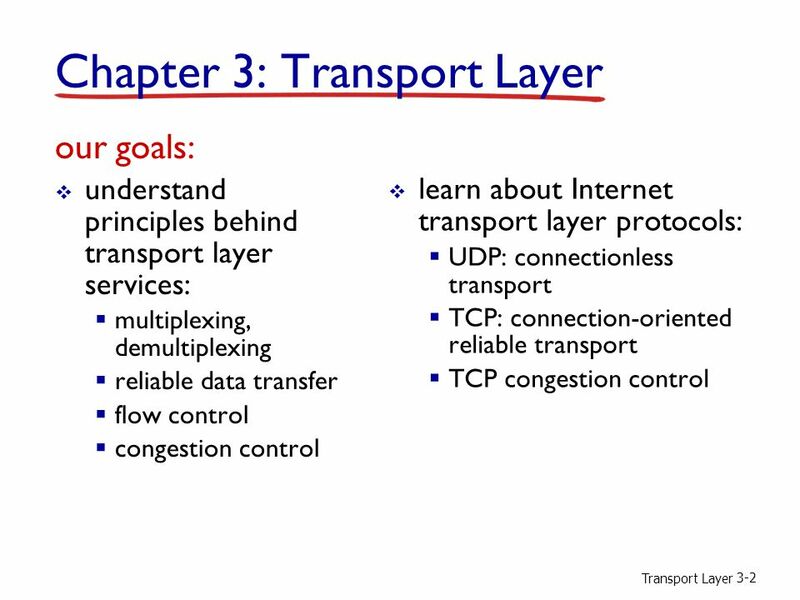 Transport Layer 3-1 Chapter 3 Transport Layer Computer Networking: A Top Down Approach 6 th edition Jim Kurose, Keith Ross Addison-Wesley March 2012 A. 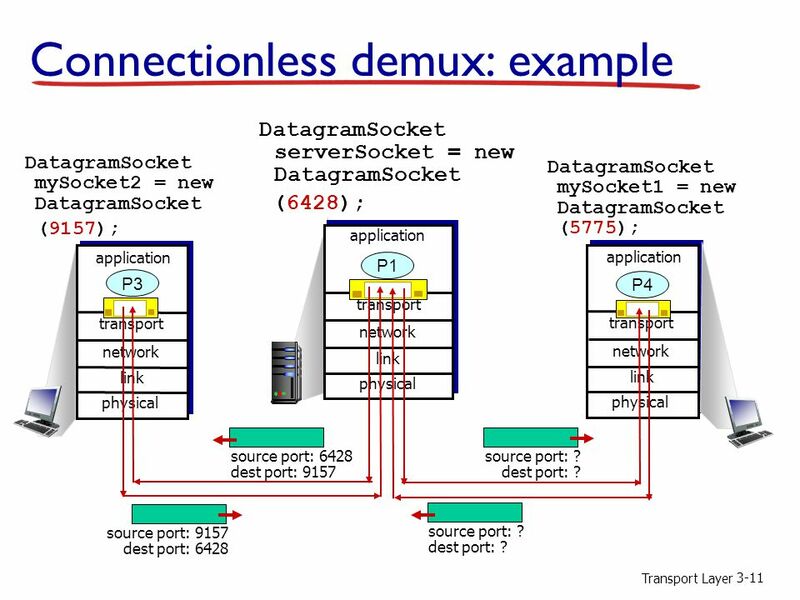 11 Transport Layer 3-11 Connectionless demux: example DatagramSocket serverSocket = new DatagramSocket (6428); transport application physical link network P3 transport application physical link network P1 transport application physical link network P4 DatagramSocket mySocket1 = new DatagramSocket (5775); DatagramSocket mySocket2 = new DatagramSocket (9157); source port: 9157 dest port: 6428 source port: 6428 dest port: 9157 source port: ? 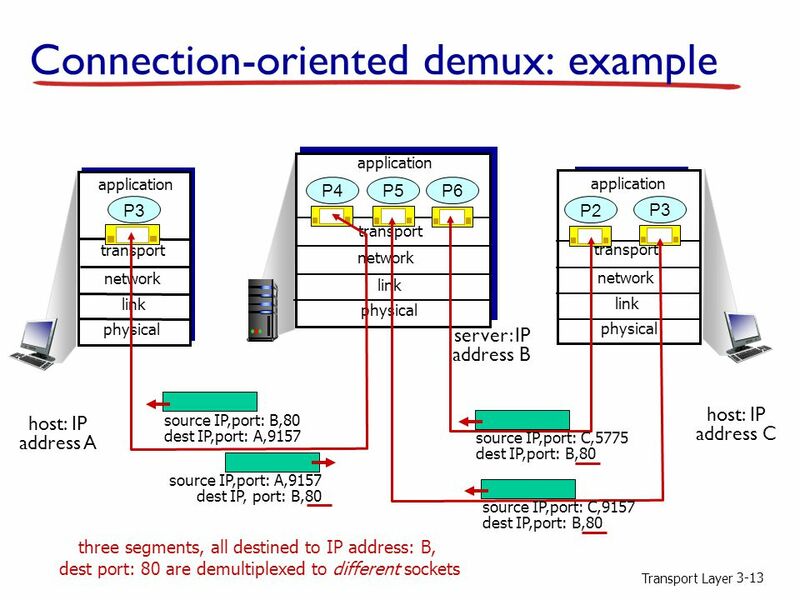 dest port: ? 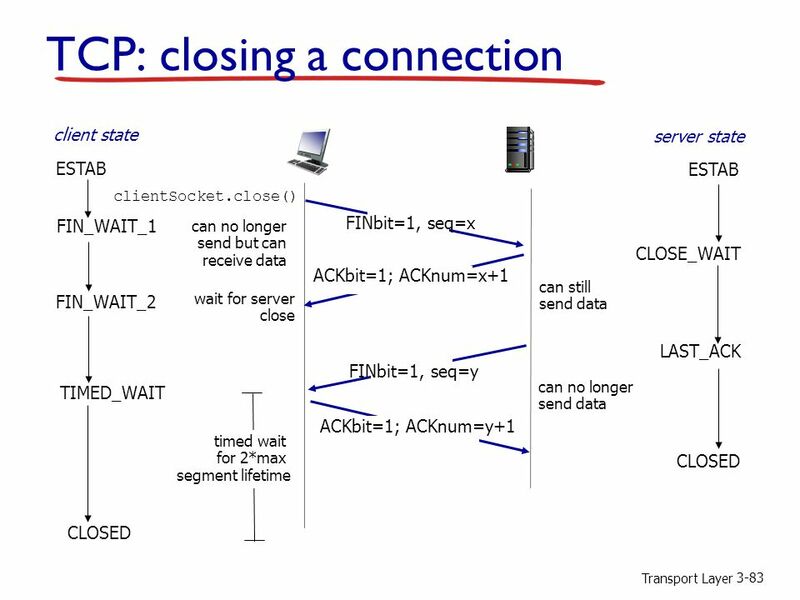 source port: ? dest port: ? 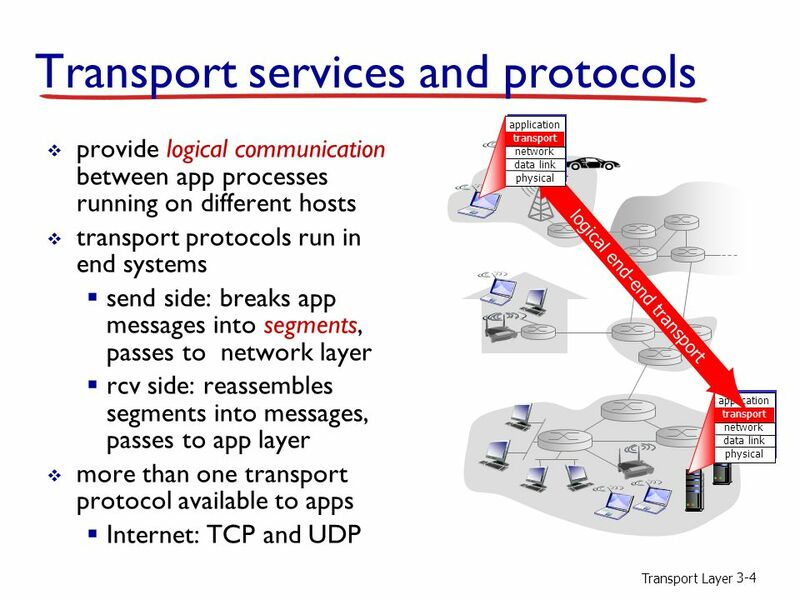 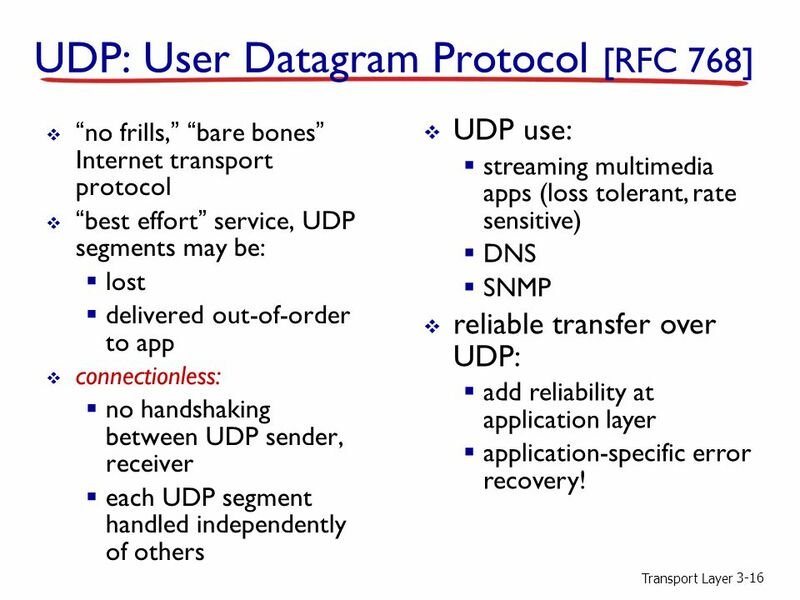 16 Transport Layer 3-16 UDP: User Datagram Protocol [RFC 768]  “no frills,” “bare bones” Internet transport protocol  “best effort” service, UDP segments may be:  lost  delivered out-of-order to app  connectionless:  no handshaking between UDP sender, receiver  each UDP segment handled independently of others  UDP use:  streaming multimedia apps (loss tolerant, rate sensitive)  DNS  SNMP  reliable transfer over UDP:  add reliability at application layer  application-specific error recovery! 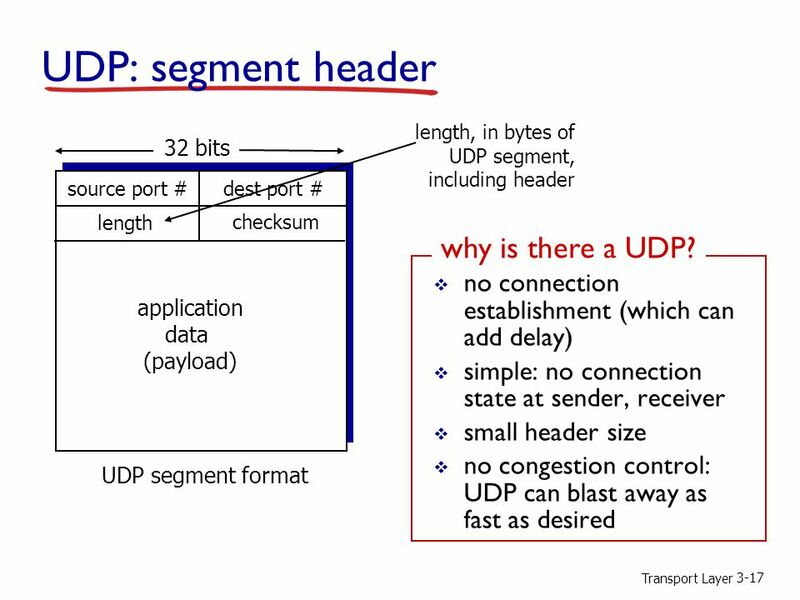 17 Transport Layer 3-17 UDP: segment header source port #dest port # 32 bits application data (payload) UDP segment format length checksum length, in bytes of UDP segment, including header  no connection establishment (which can add delay)  simple: no connection state at sender, receiver  small header size  no congestion control: UDP can blast away as fast as desired why is there a UDP? 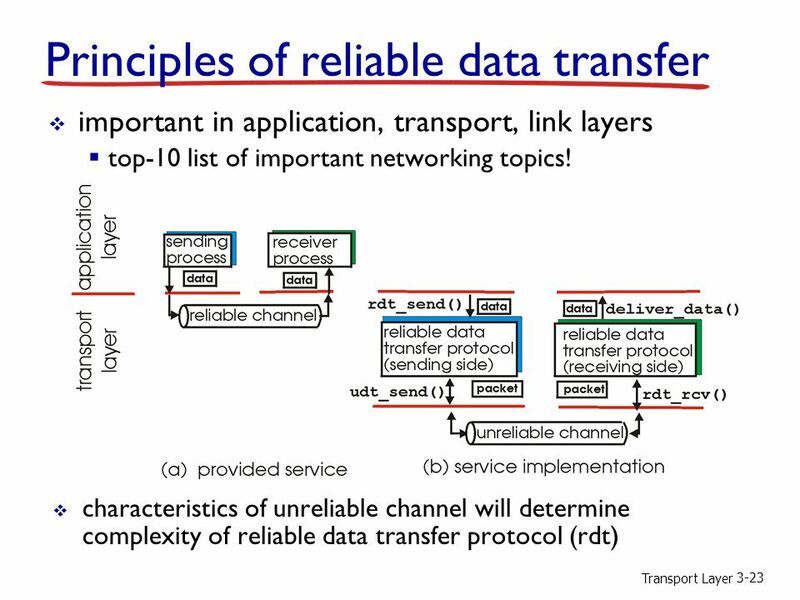 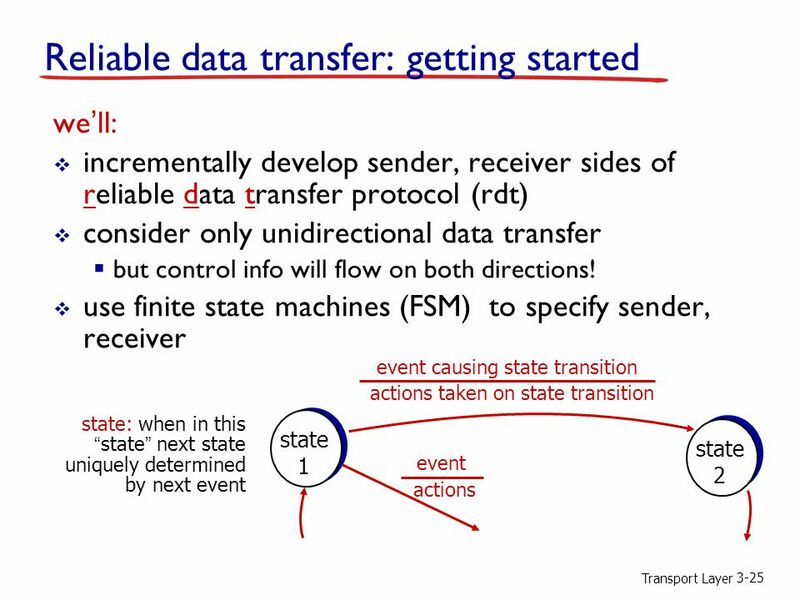 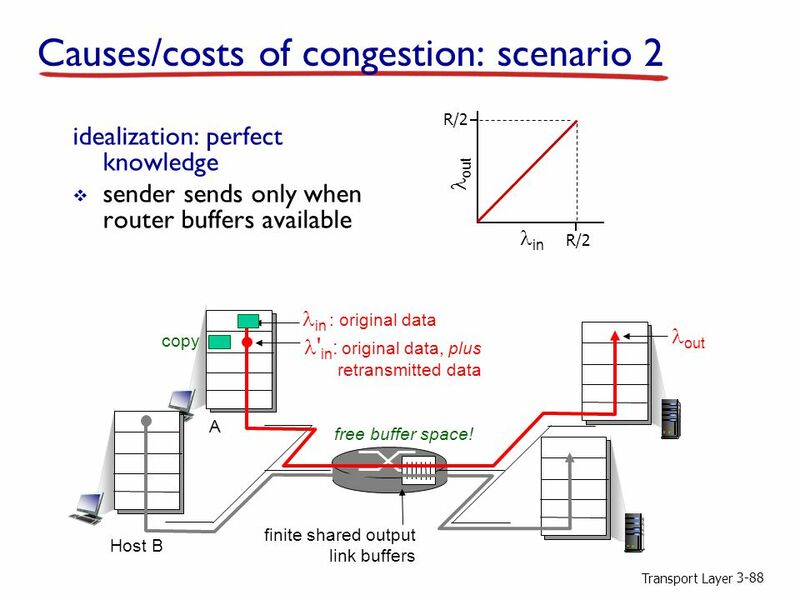 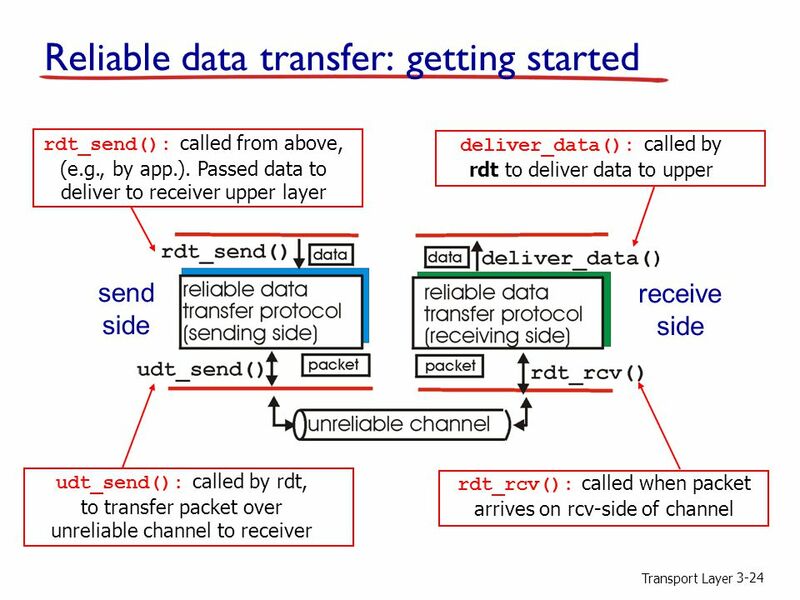 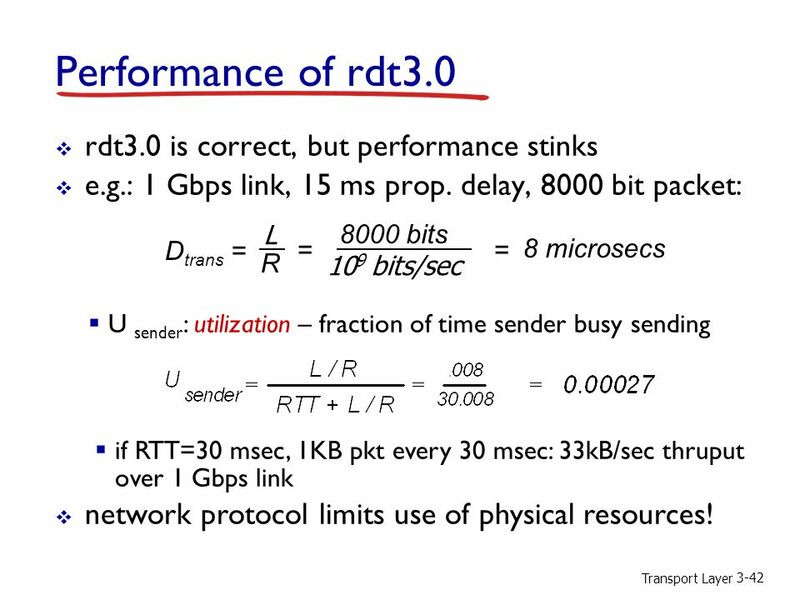 22 Transport Layer 3-22  characteristics of unreliable channel will determine complexity of reliable data transfer protocol (rdt) Principles of reliable data transfer  important in application, transport, link layers  top-10 list of important networking topics! 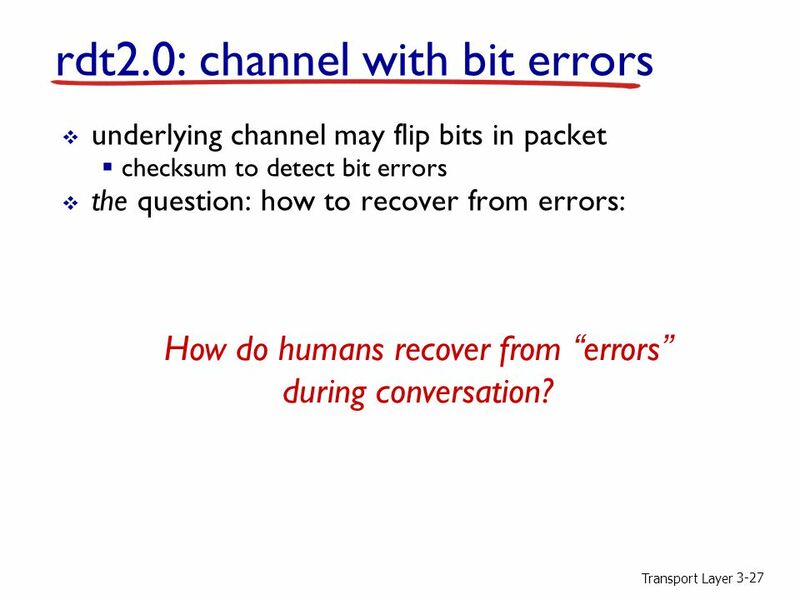 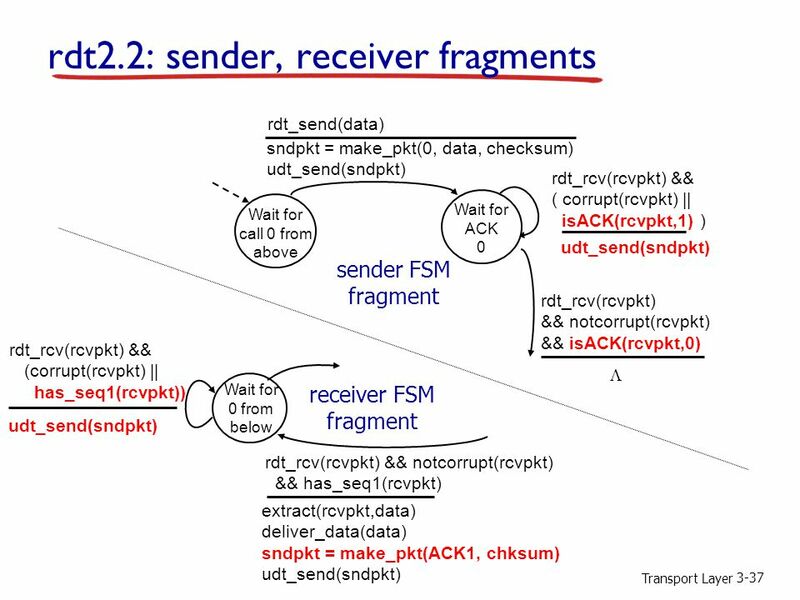 27 Transport Layer 3-27  underlying channel may flip bits in packet  checksum to detect bit errors  the question: how to recover from errors:  acknowledgements (ACKs): receiver explicitly tells sender that pkt received OK  negative acknowledgements (NAKs): receiver explicitly tells sender that pkt had errors  sender retransmits pkt on receipt of NAK  new mechanisms in rdt2.0 (beyond rdt1.0 ):  error detection  receiver feedback: control msgs (ACK,NAK) rcvr- >sender rdt2.0: channel with bit errors How do humans recover from “errors” during conversation? 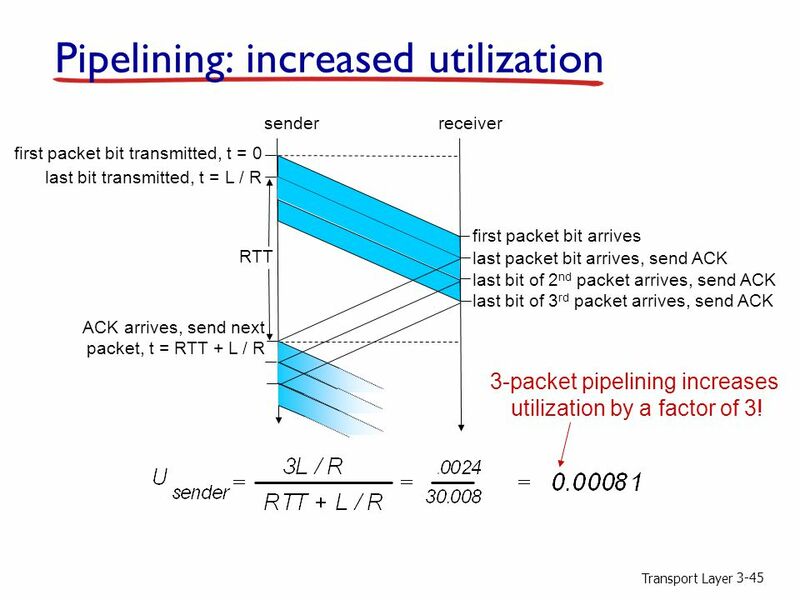 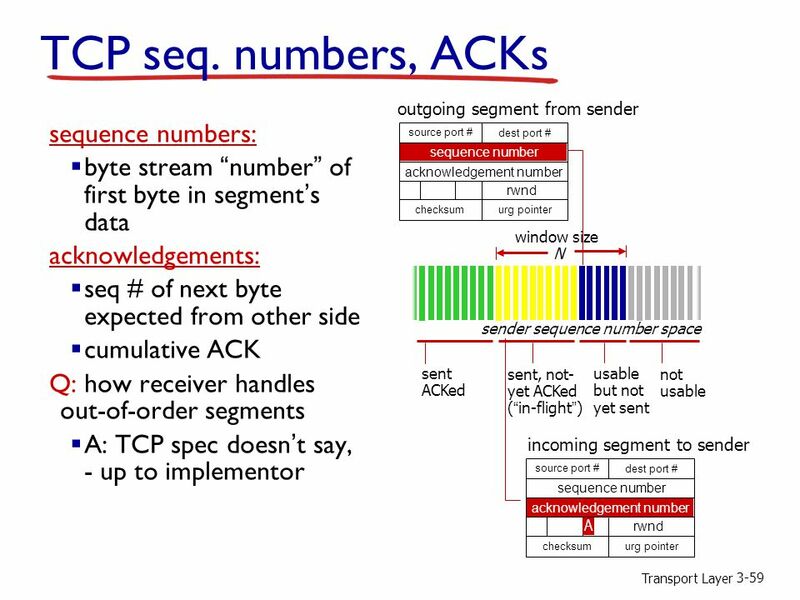 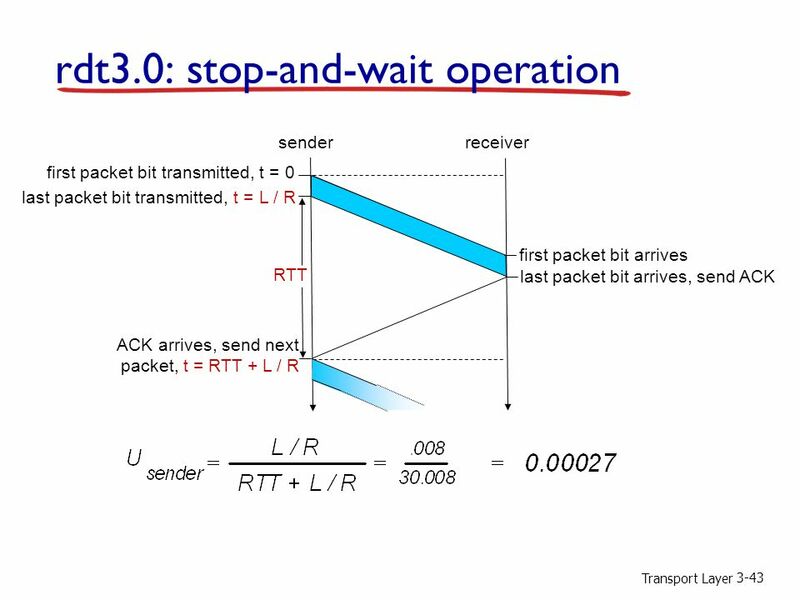 45 Transport Layer 3-45 Pipelining: increased utilization first packet bit transmitted, t = 0 senderreceiver RTT last bit transmitted, t = L / R first packet bit arrives last packet bit arrives, send ACK ACK arrives, send next packet, t = RTT + L / R last bit of 2 nd packet arrives, send ACK last bit of 3 rd packet arrives, send ACK 3-packet pipelining increases utilization by a factor of 3! 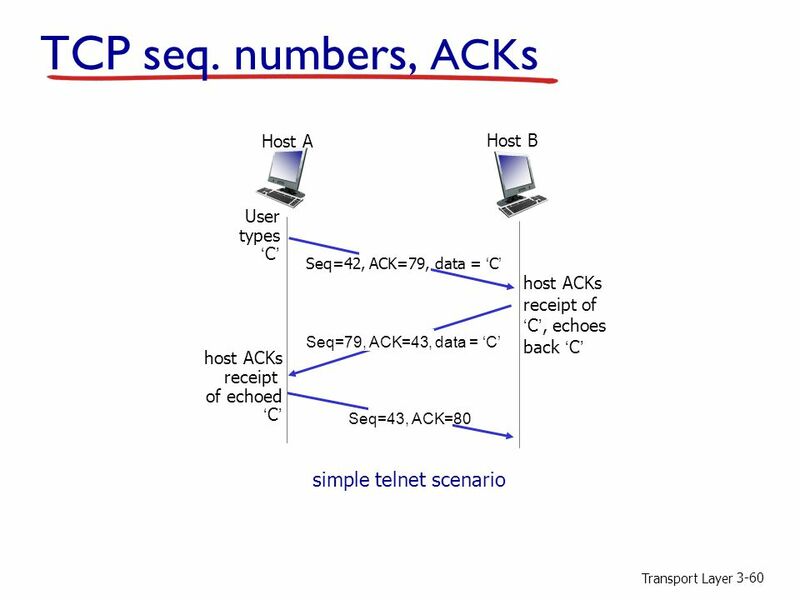 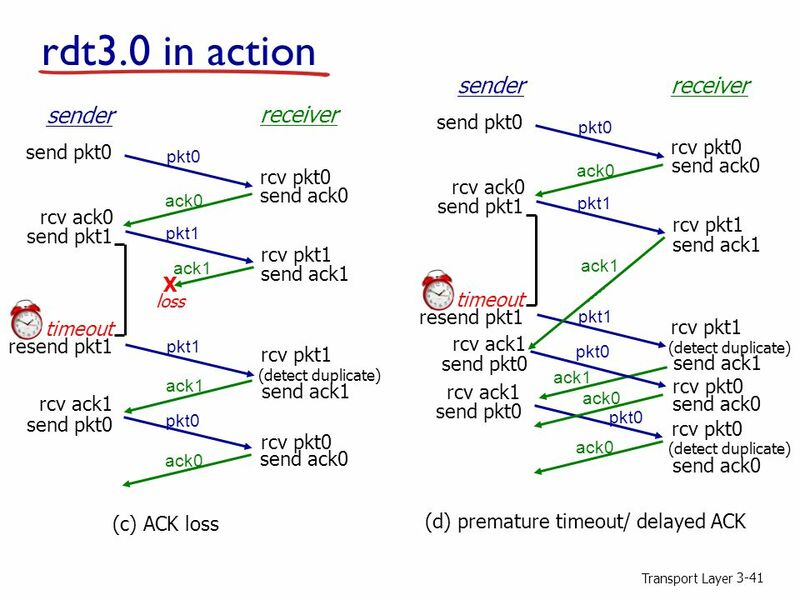 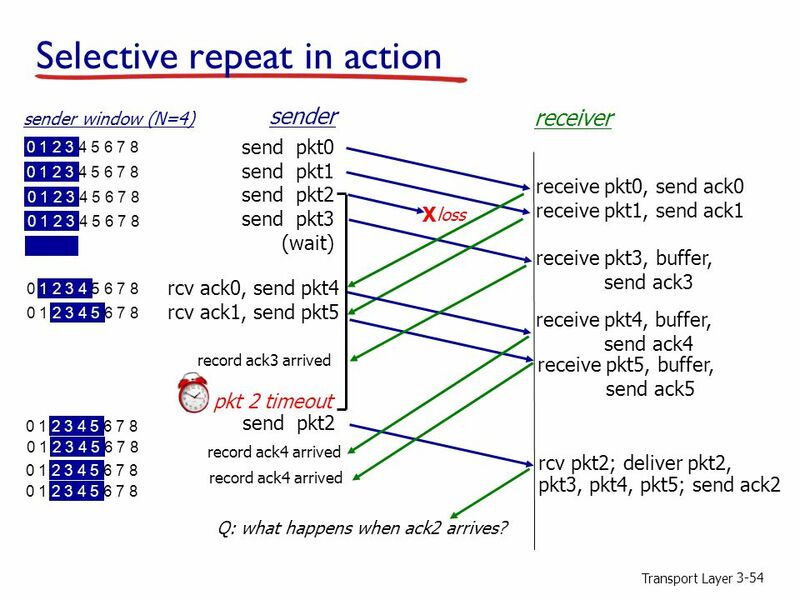 54 Transport Layer 3-54 Selective repeat in action send pkt0 send pkt1 send pkt2 send pkt3 (wait) sender receiver receive pkt0, send ack0 receive pkt1, send ack1 receive pkt3, buffer, send ack3 rcv ack0, send pkt4 rcv ack1, send pkt5 pkt 2 timeout send pkt2 X loss receive pkt4, buffer, send ack4 receive pkt5, buffer, send ack5 rcv pkt2; deliver pkt2, pkt3, pkt4, pkt5; send ack2 record ack3 arrived 0 1 2 3 4 5 6 7 8 sender window (N=4) 0 1 2 3 4 5 6 7 8 record ack4 arrived Q: what happens when ack2 arrives? 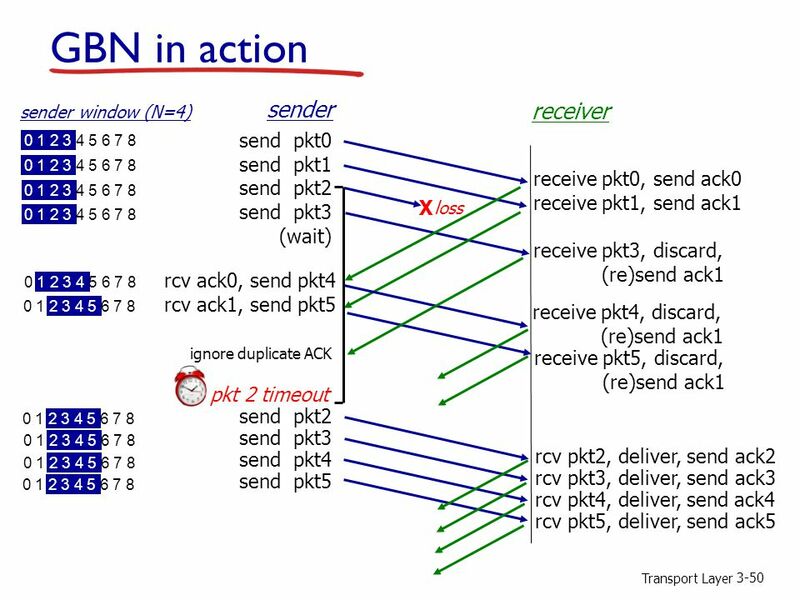 55 Transport Layer 3-55 Selective repeat: dilemma example:  seq #’s: 0, 1, 2, 3  window size=3 receiver window (after receipt) sender window (after receipt) 0 1 2 3 0 1 2 pkt0 pkt1 pkt2 0 1 2 3 0 1 2 pkt0 timeout retransmit pkt0 0 1 2 3 0 1 2 X X X will accept packet with seq number 0 (b) oops! 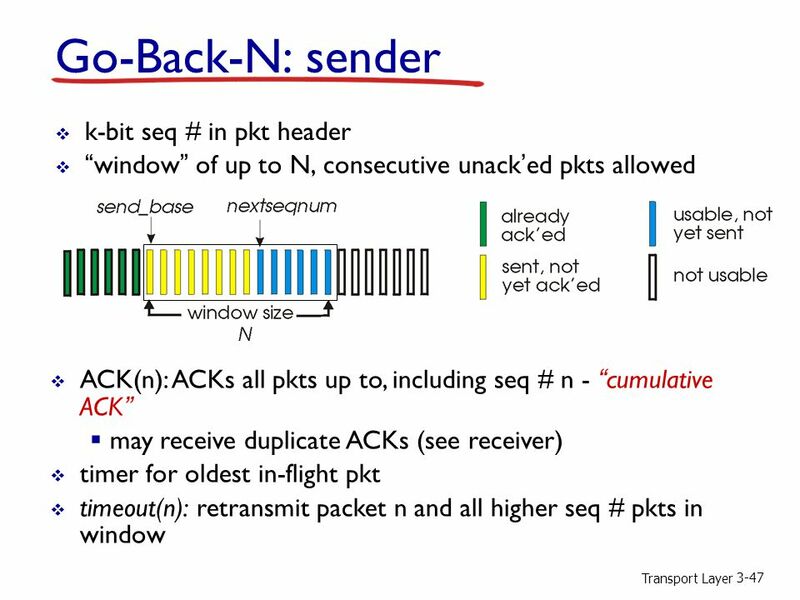 0 1 2 3 0 1 2 pkt0 pkt1 pkt2 0 1 2 3 0 1 2 pkt0 0 1 2 3 0 1 2 X will accept packet with seq number 0 0 1 2 3 0 1 2 pkt3 (a) no problem receiver can’t see sender side. 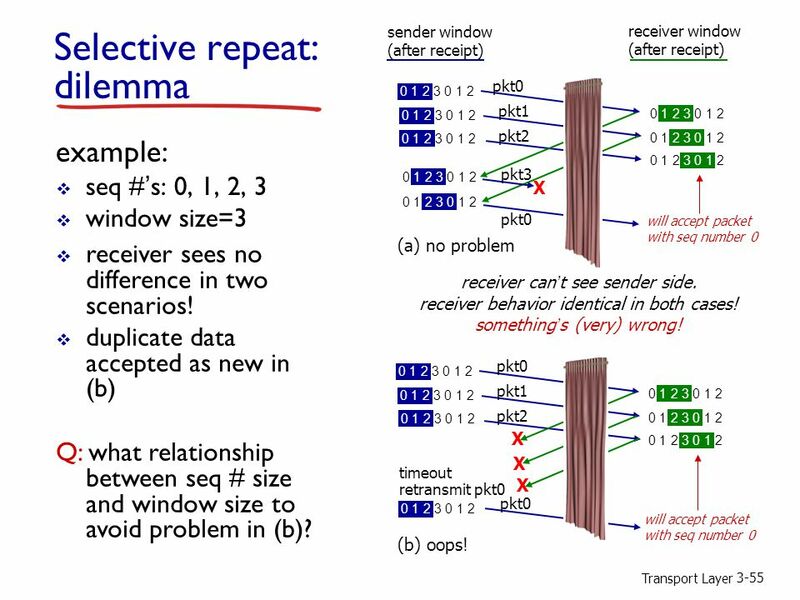 receiver behavior identical in both cases! 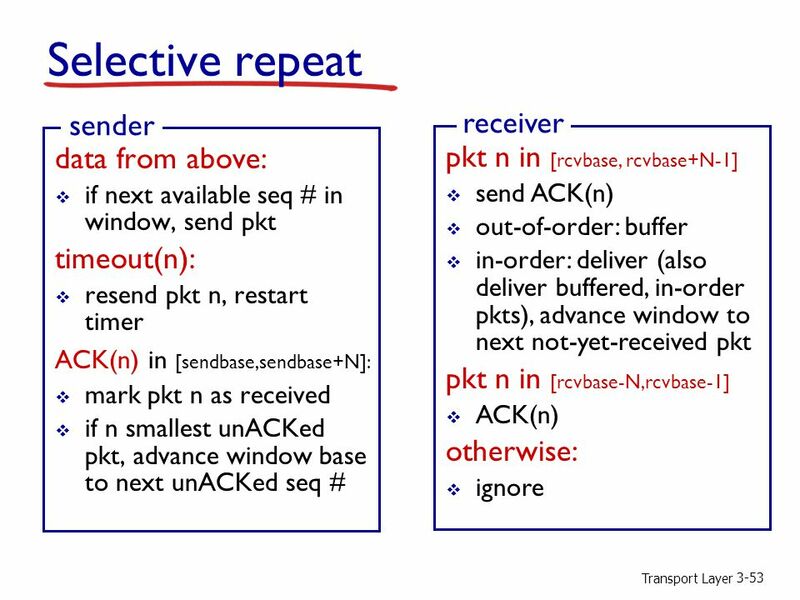 something’s (very) wrong! 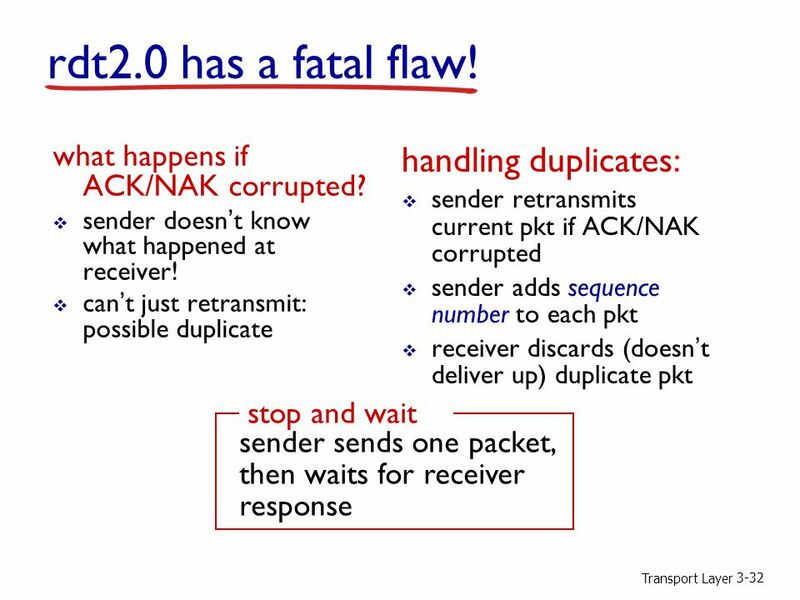  receiver sees no difference in two scenarios! 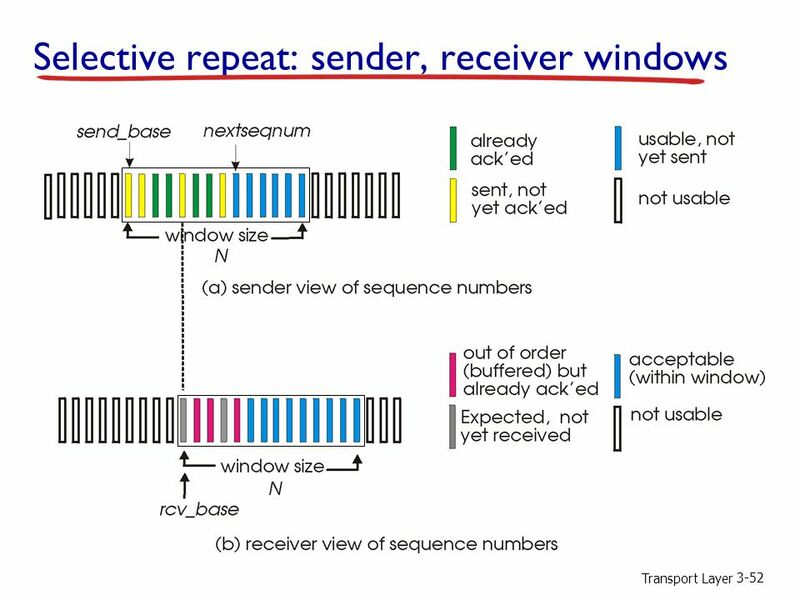  duplicate data accepted as new in (b) Q: what relationship between seq # size and window size to avoid problem in (b)? 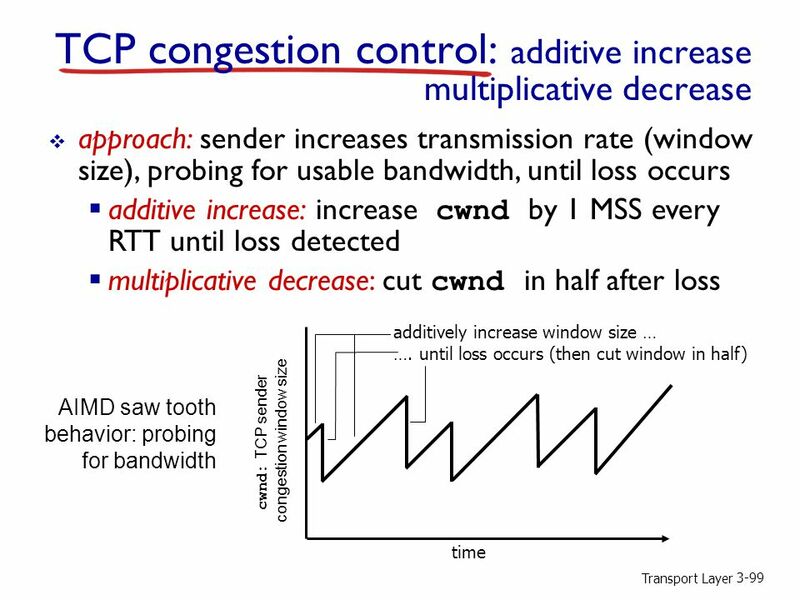 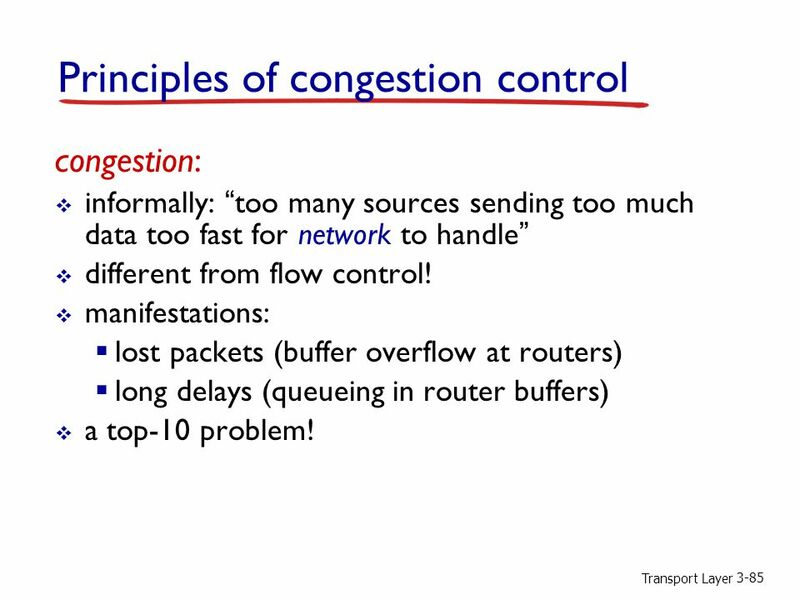 104 Transport Layer 3-104 Summary: TCP Congestion Control timeout ssthresh = cwnd/2 cwnd = 1 MSS dupACKcount = 0 retransmit missing segment  cwnd > ssthresh congestion avoidance cwnd = cwnd + MSS (MSS/cwnd) dupACKcount = 0 transmit new segment(s), as allowed new ACK. 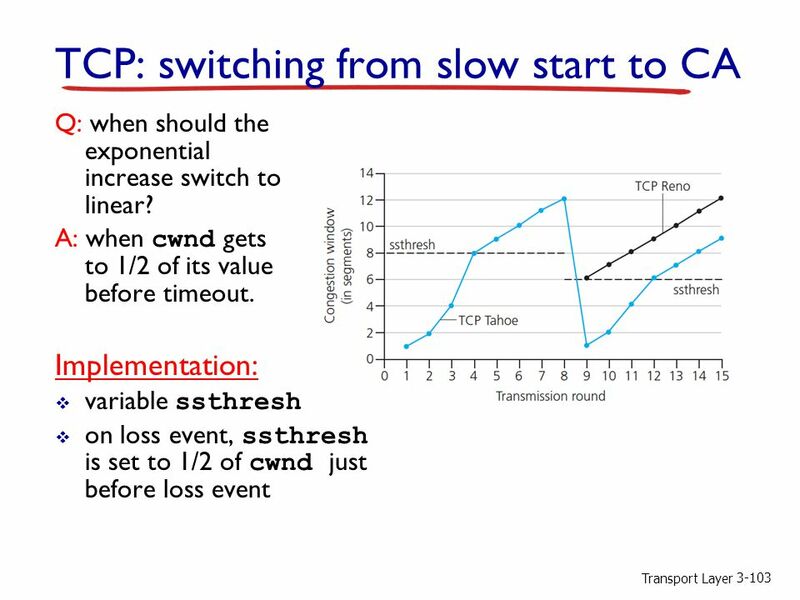 dupACKcount++ duplicate ACK fast recovery cwnd = cwnd + MSS transmit new segment(s), as allowed duplicate ACK ssthresh= cwnd/2 cwnd = ssthresh + 3 retransmit missing segment dupACKcount == 3 timeout ssthresh = cwnd/2 cwnd = 1 dupACKcount = 0 retransmit missing segment ssthresh= cwnd/2 cwnd = ssthresh + 3 retransmit missing segment dupACKcount == 3 cwnd = ssthresh dupACKcount = 0 New ACK slow start timeout ssthresh = cwnd/2 cwnd = 1 MSS dupACKcount = 0 retransmit missing segment cwnd = cwnd+MSS dupACKcount = 0 transmit new segment(s), as allowed new ACK dupACKcount++ duplicate ACK  cwnd = 1 MSS ssthresh = 64 KB dupACKcount = 0 New ACK! 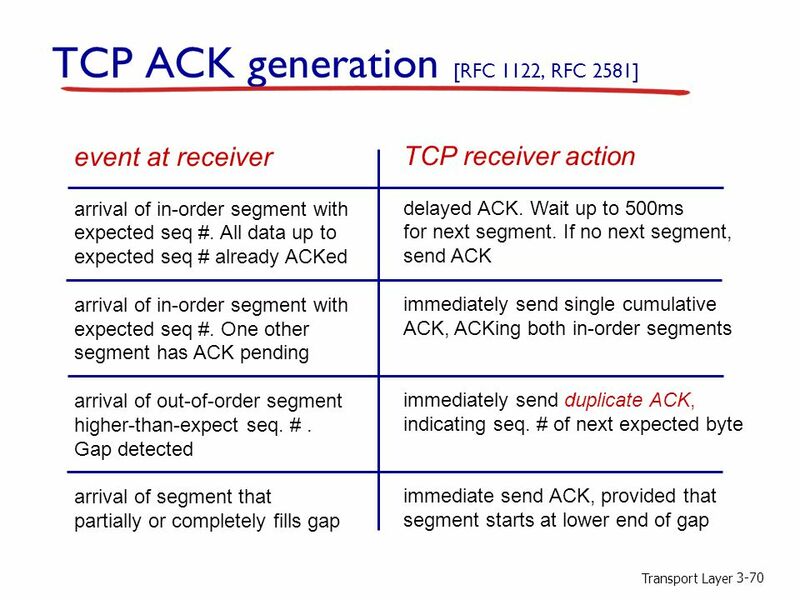 New ACK! 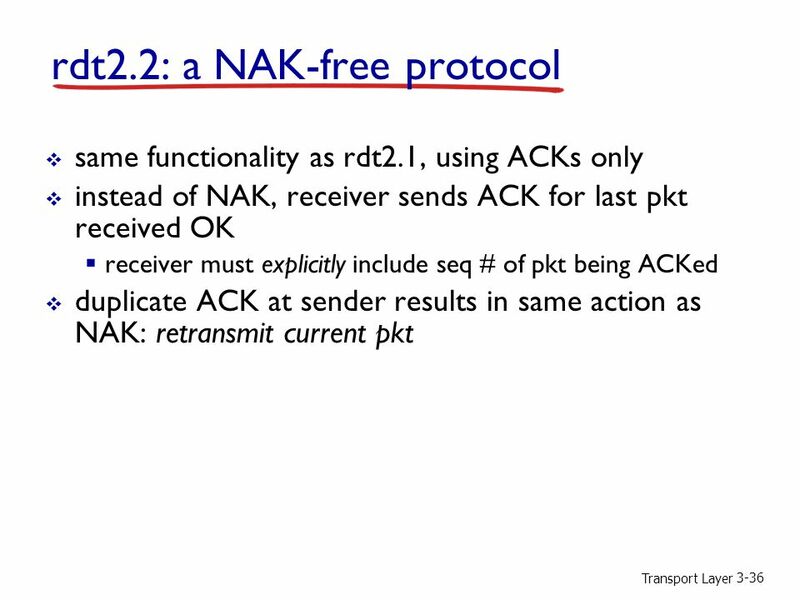 New ACK! 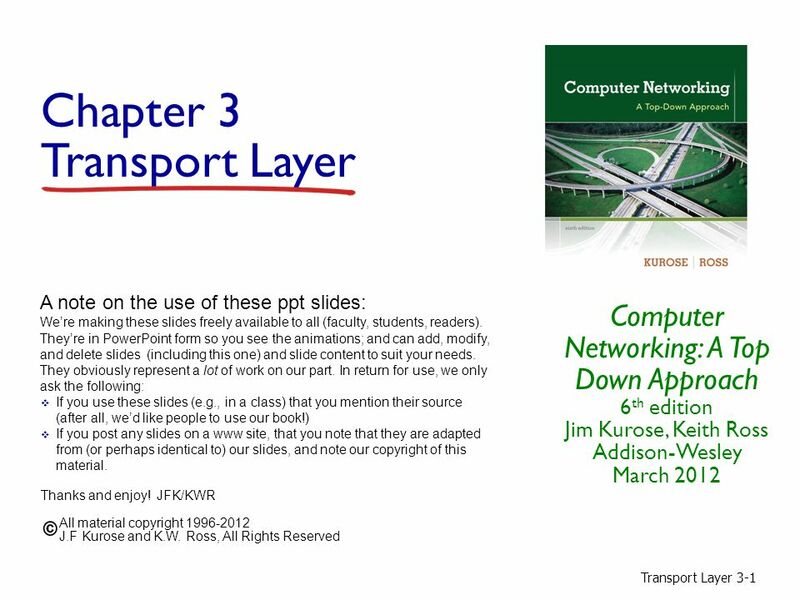 Download ppt "Transport Layer 3-1 Chapter 3 Transport Layer Computer Networking: A Top Down Approach 6 th edition Jim Kurose, Keith Ross Addison-Wesley March 2012 A." 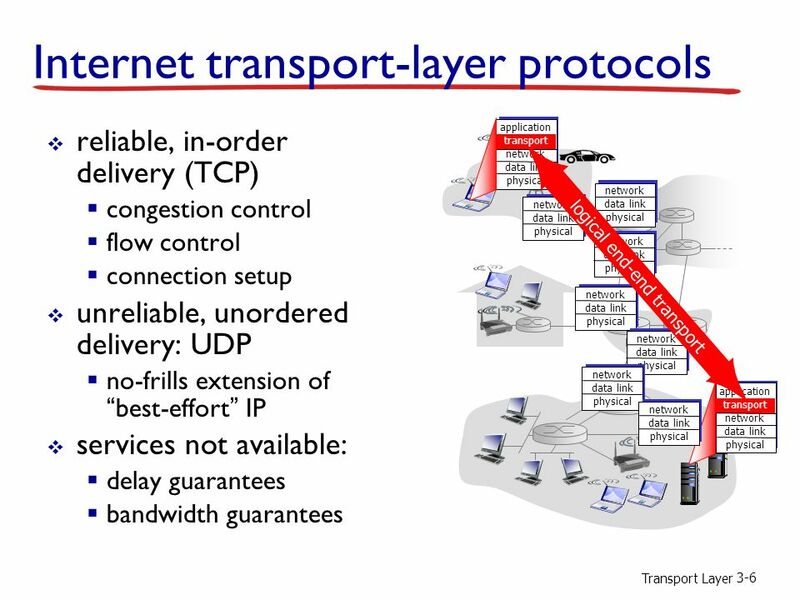 1 Transport Layer. 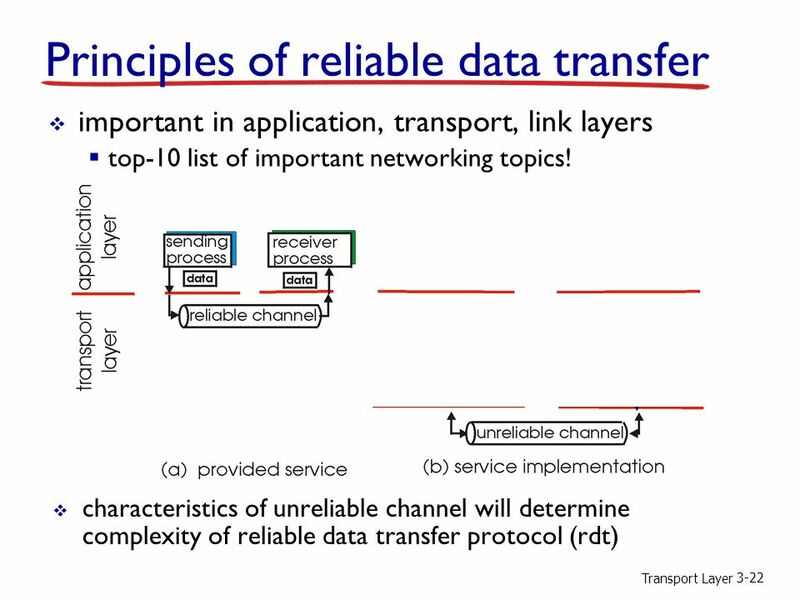 2 Chapter 3: Transport Layer Our goals: understand principles behind transport layer services:  multiplexing/ demultiplexing  reliable. 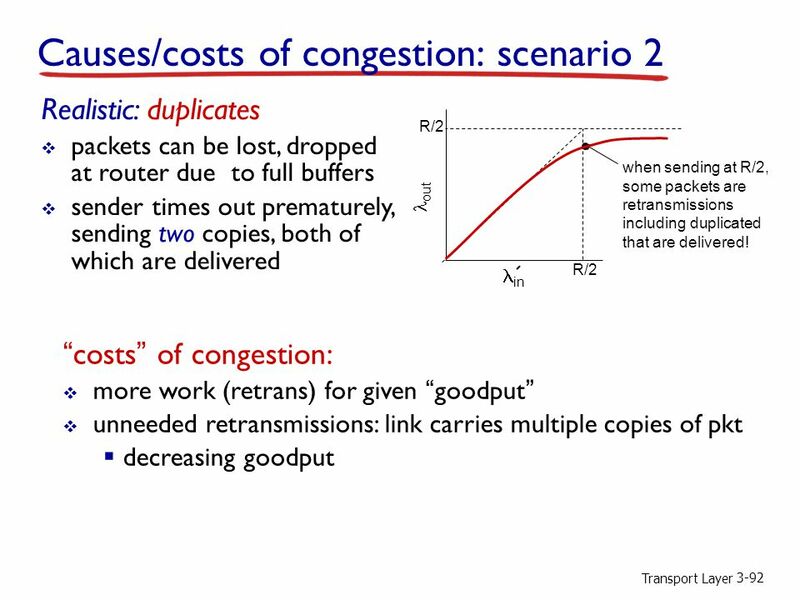 Introduction 1 Lecture 13 Transport Layer (Transmission Control Protocol) slides are modified from J. Kurose & K. Ross University of Nevada – Reno Computer. 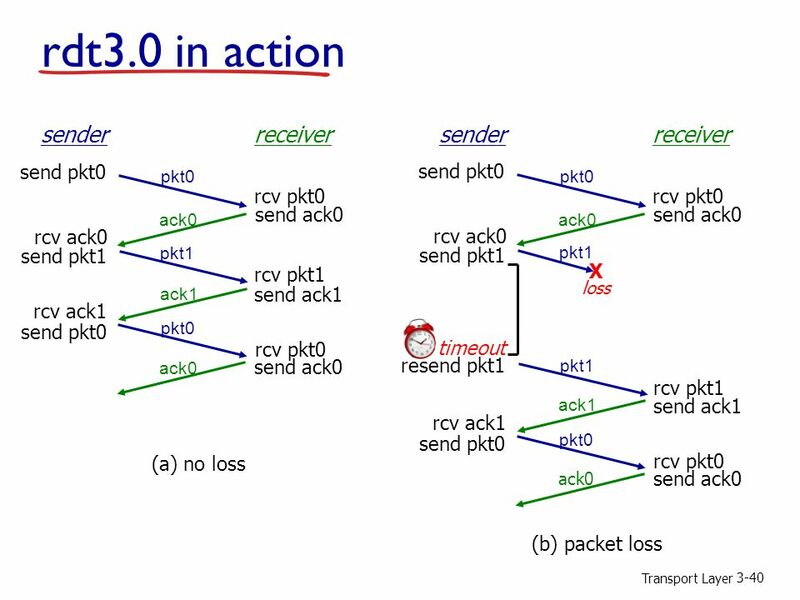 Transport Layer3-1 Transport Overview and UDP. 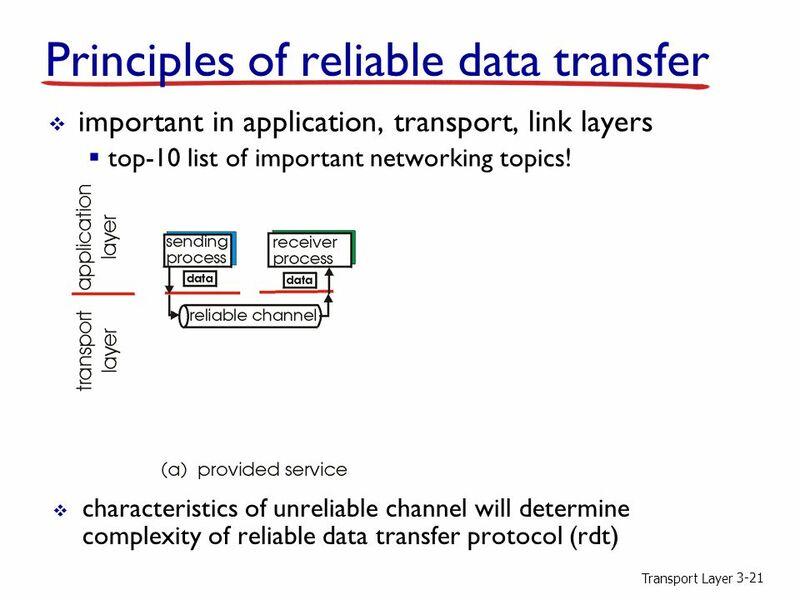 Transport Layer3-2 Goals r Understand transport services m Multiplexing and Demultiplexing m Reliable data. 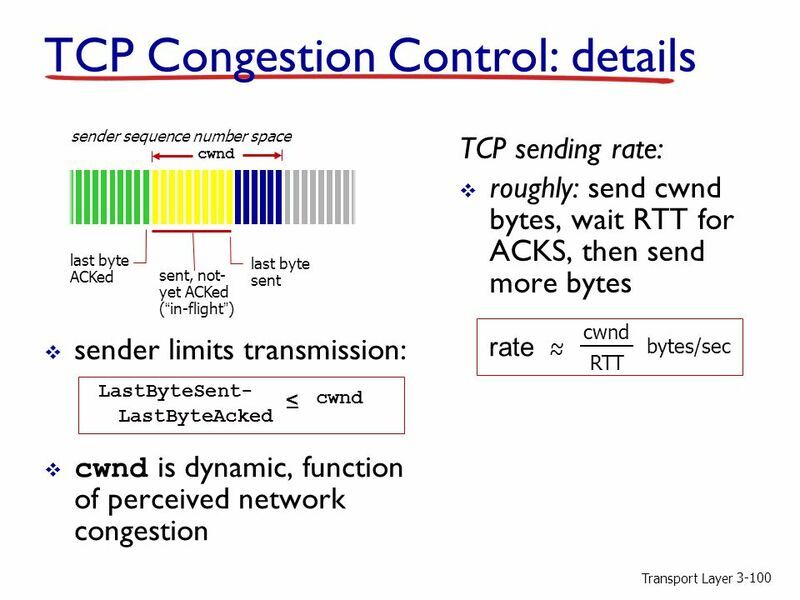 Transport Layer3-1 TCP. 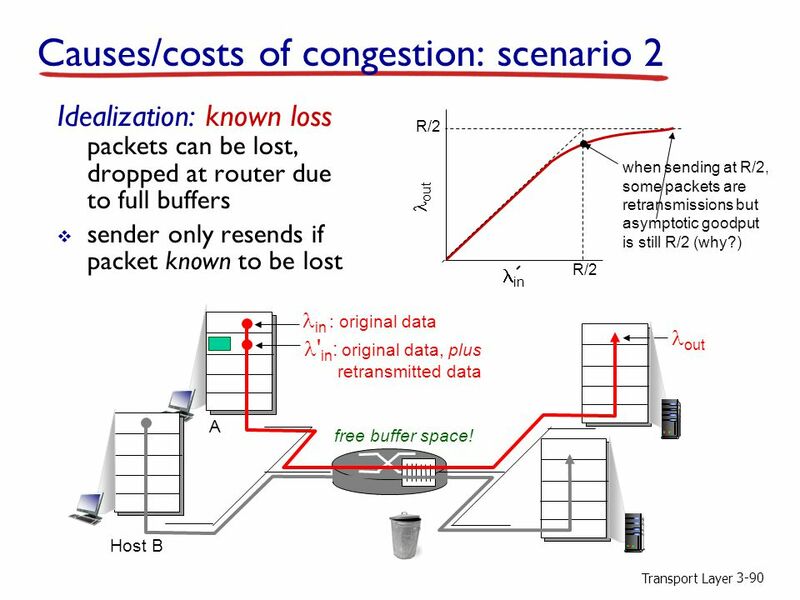 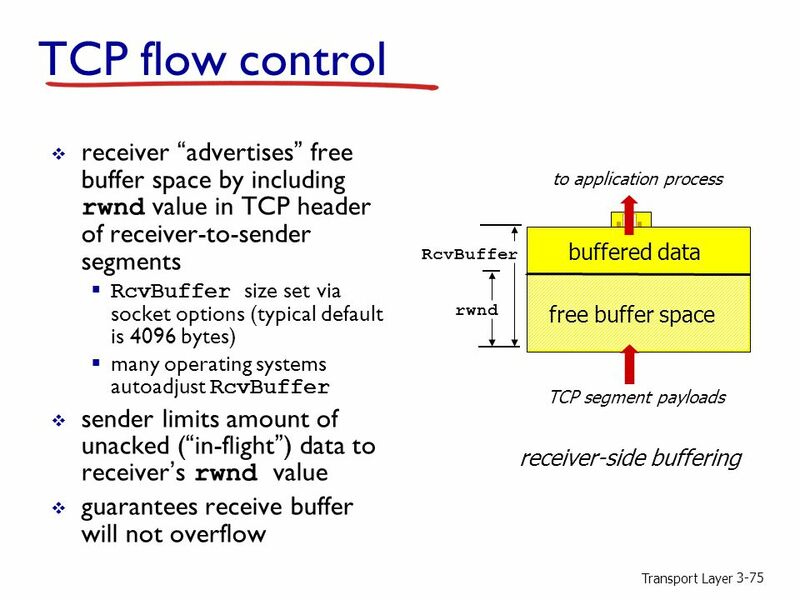 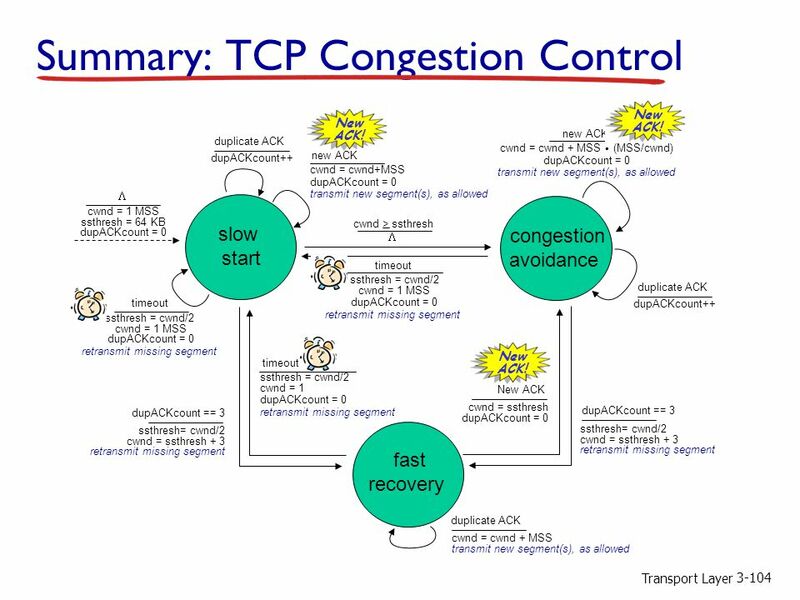 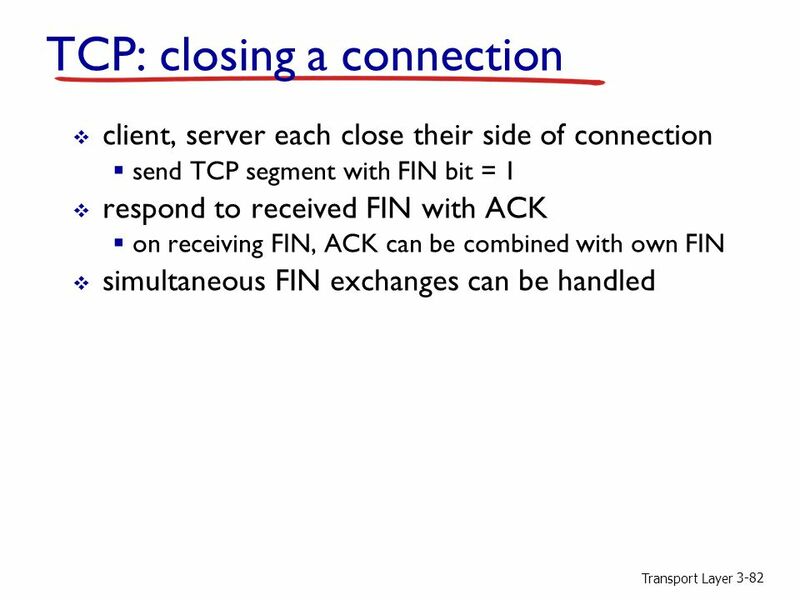 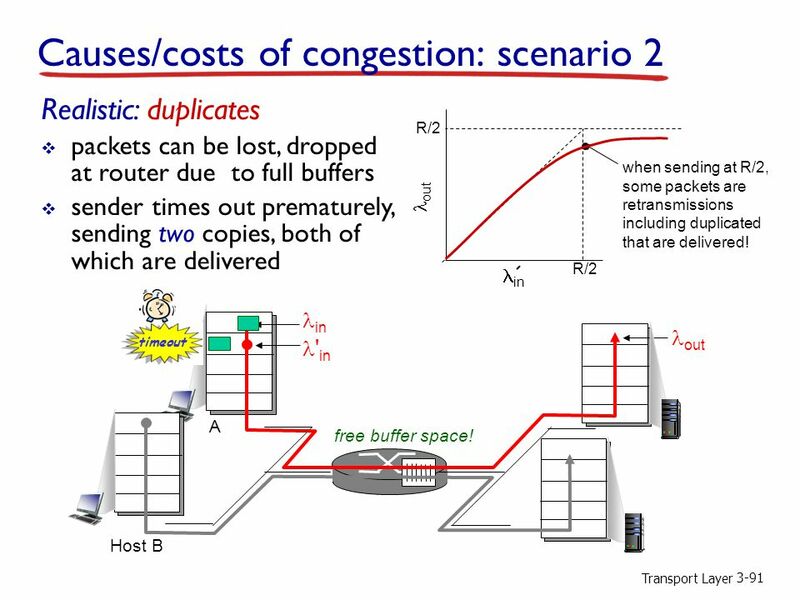 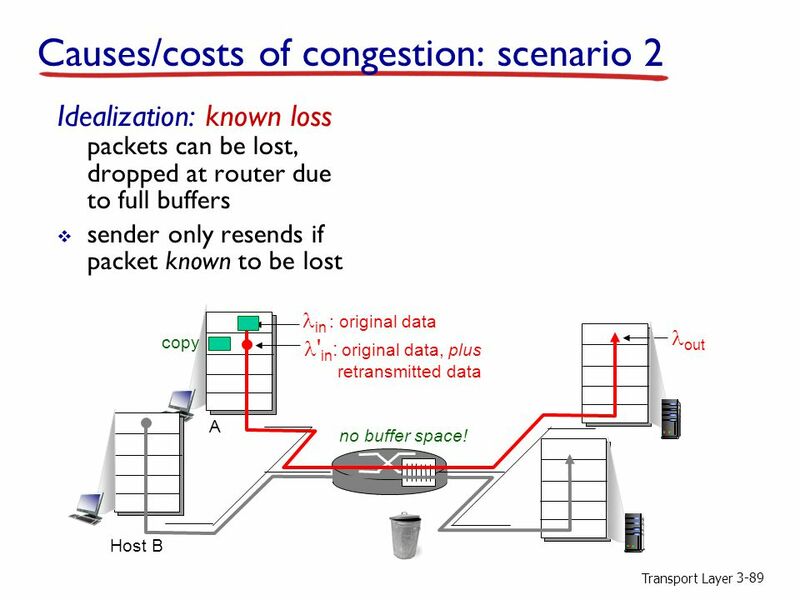 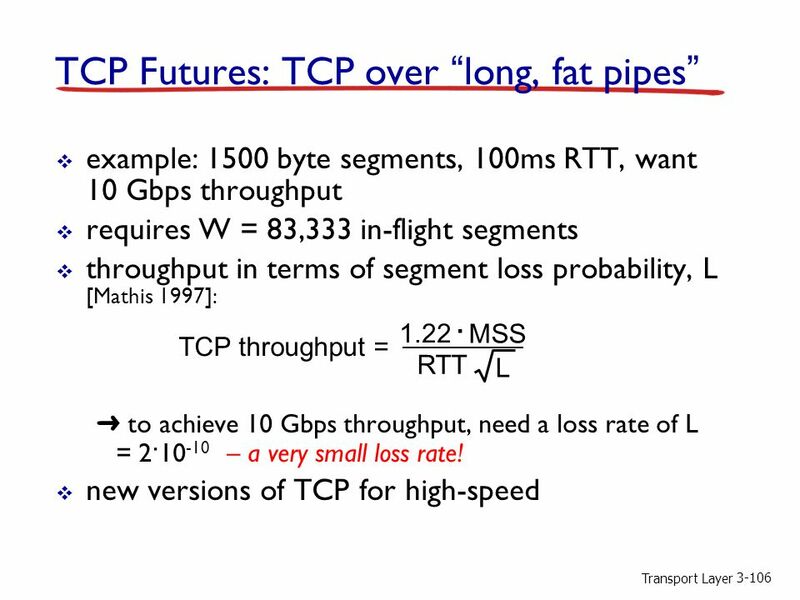 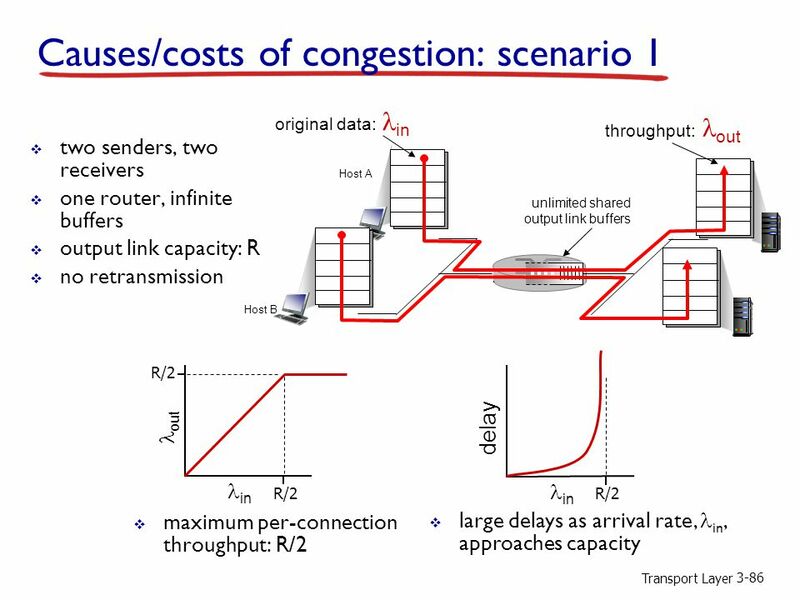 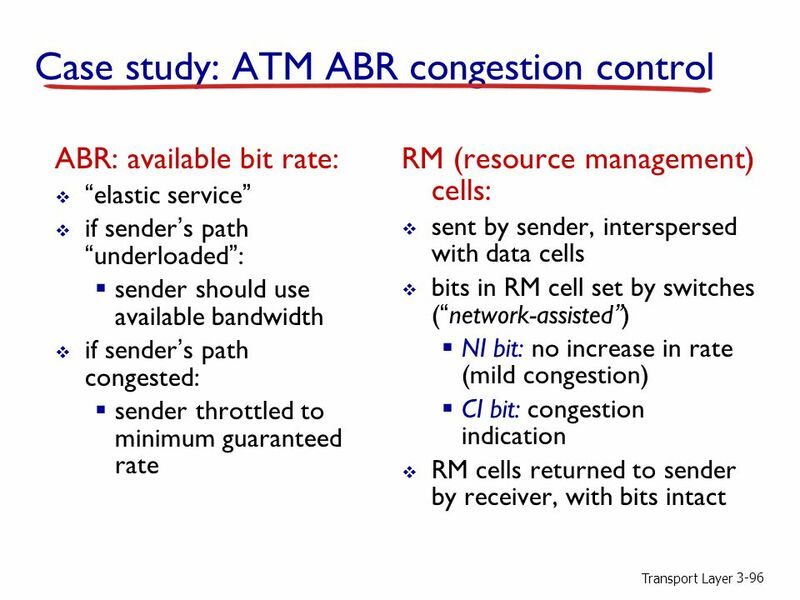 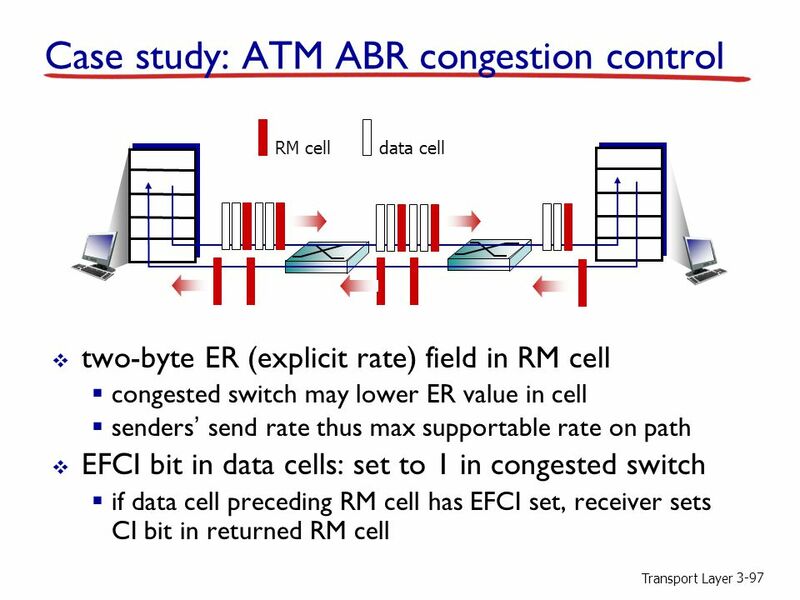 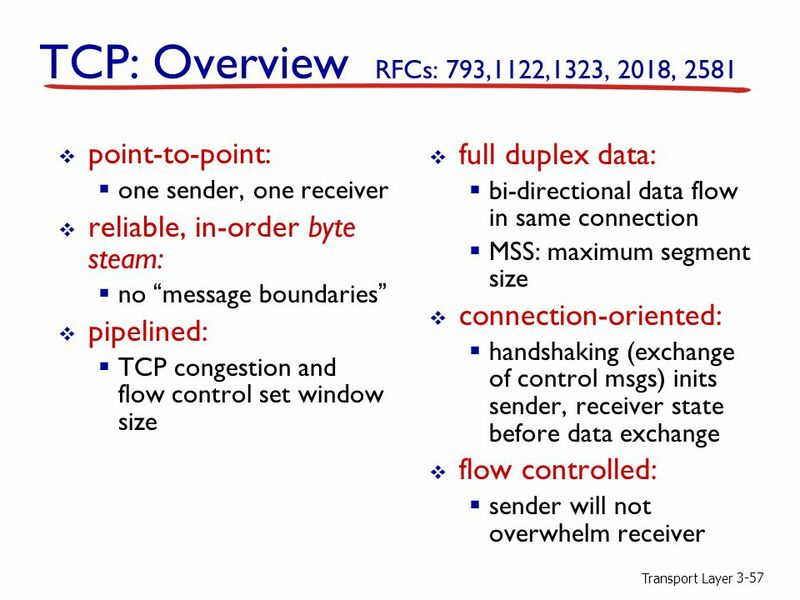 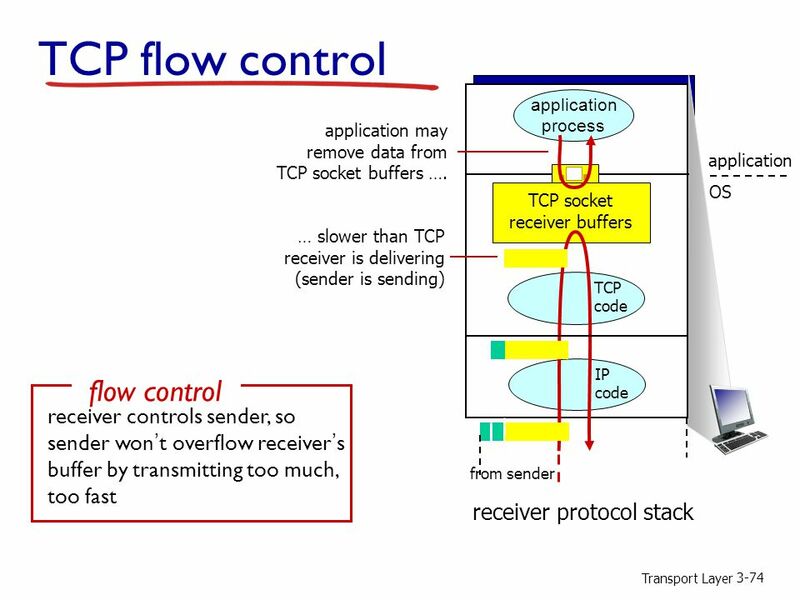 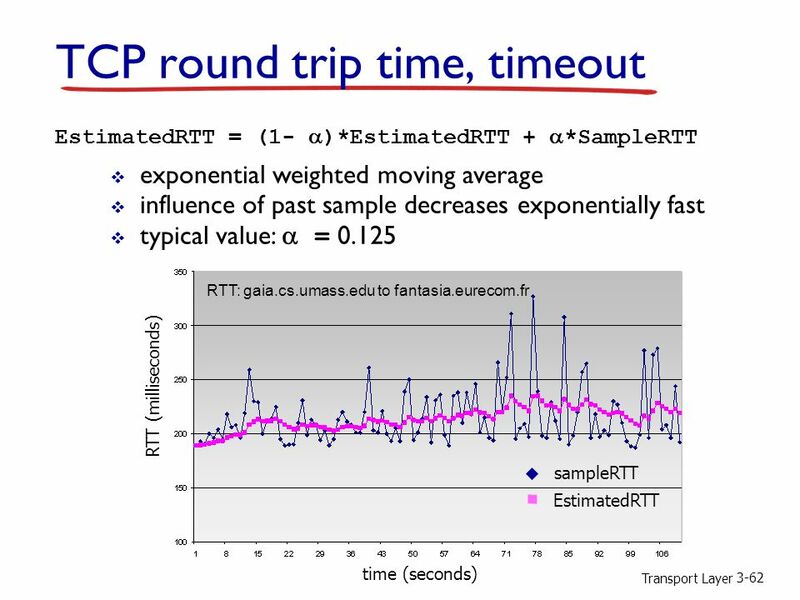 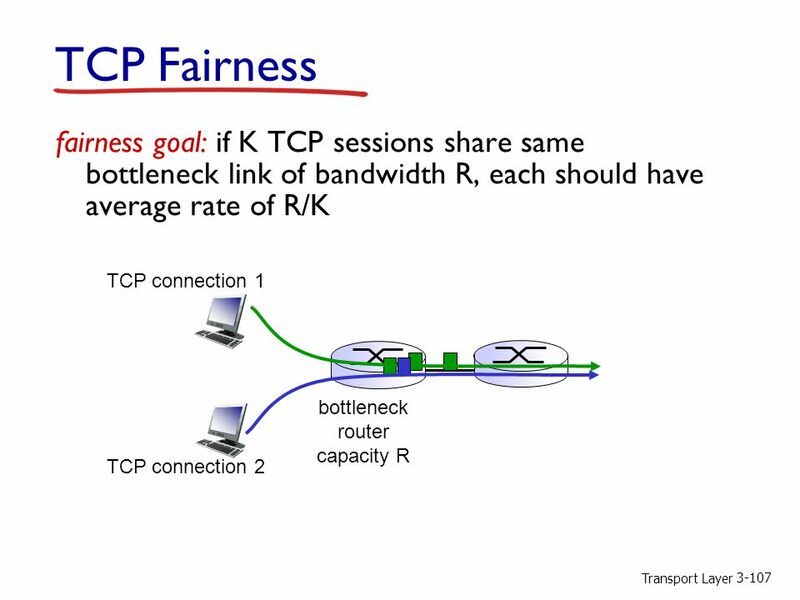 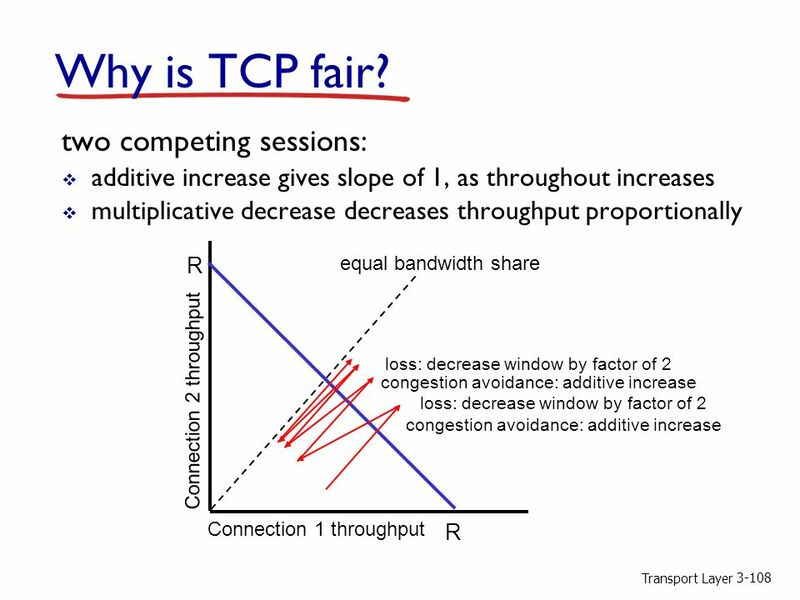 Transport Layer3-2 TCP: Overview RFCs: 793, 1122, 1323, 2018, 2581 r full duplex data: m bi-directional data flow in same connection. 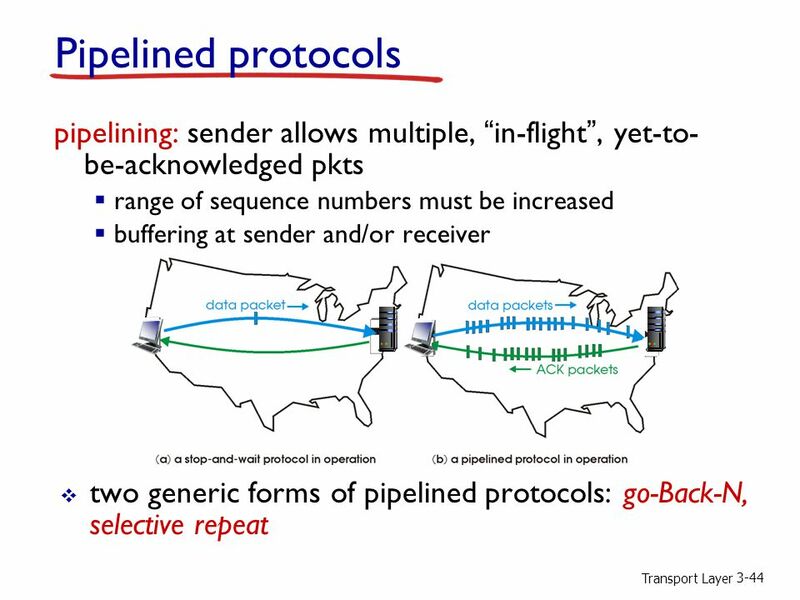 3-1 TCP Protocol r point-to-point: m one sender, one receiver r reliable, in-order byte steam: m no “message boundaries” r pipelined: m TCP congestion. 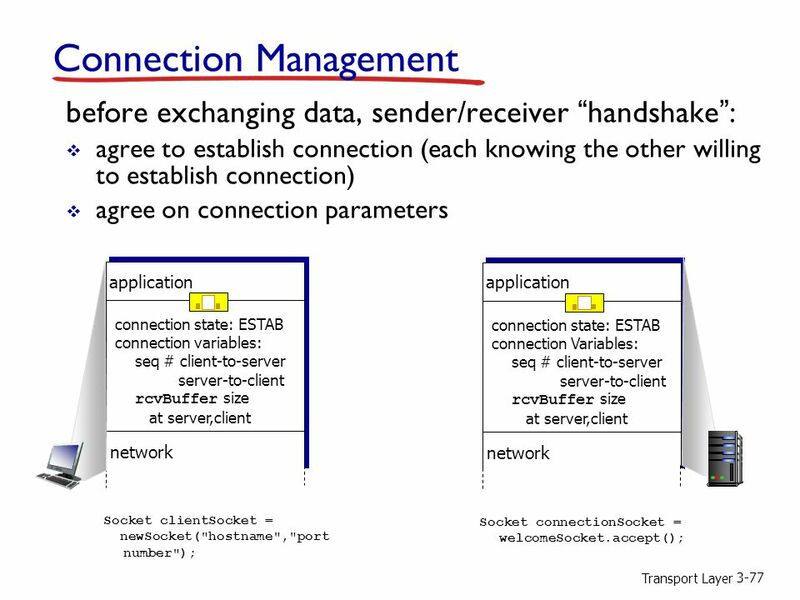 Data Communications and Computer Networks Chapter 3 CS 3830 Lecture 16 Omar Meqdadi Department of Computer Science and Software Engineering University. 1 Chapter 3 Transport Layer. 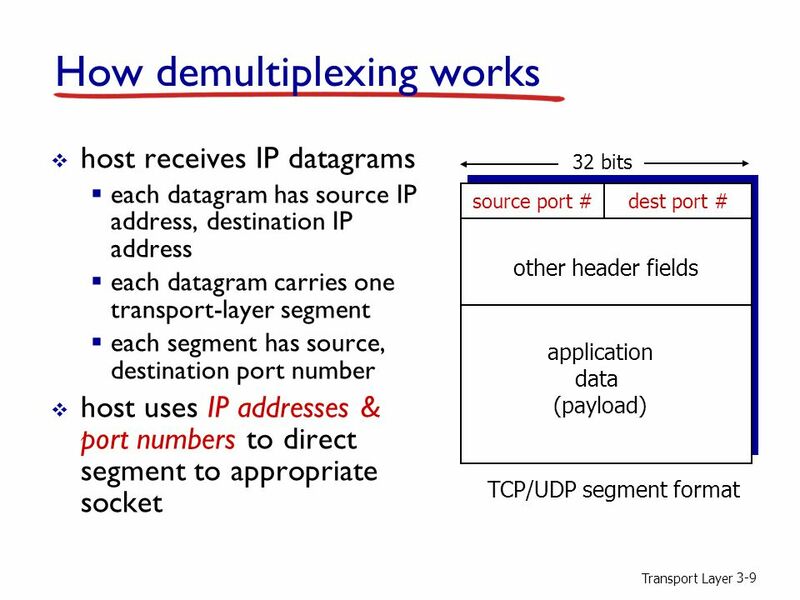 2 Chapter 3 outline 3.1 Transport-layer services 3.2 Multiplexing and demultiplexing 3.3 Connectionless transport: UDP 3.4. 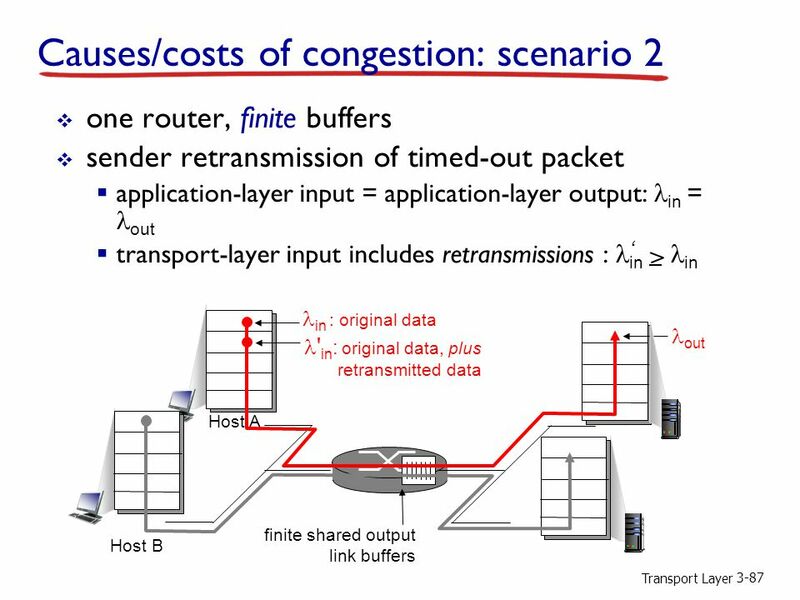 1 Transport Layer Lecture 9 Imran Ahmed University of Management & Technology. 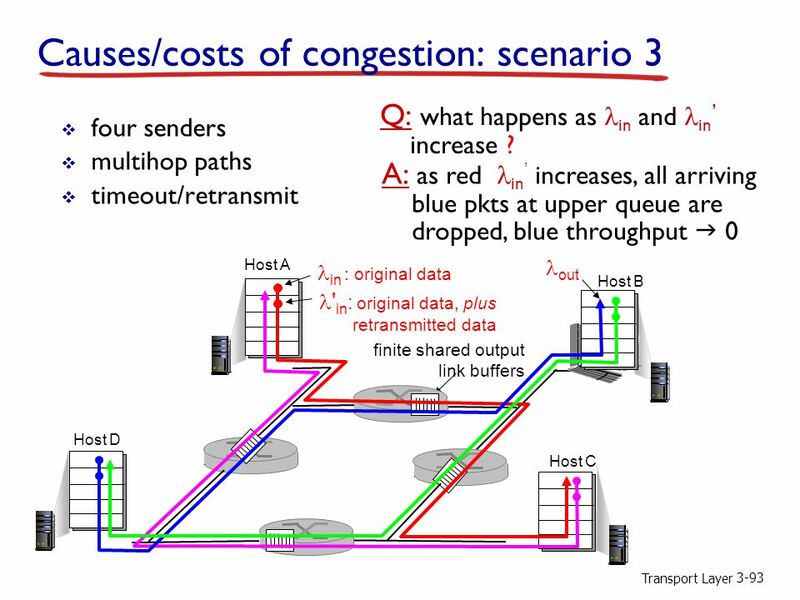 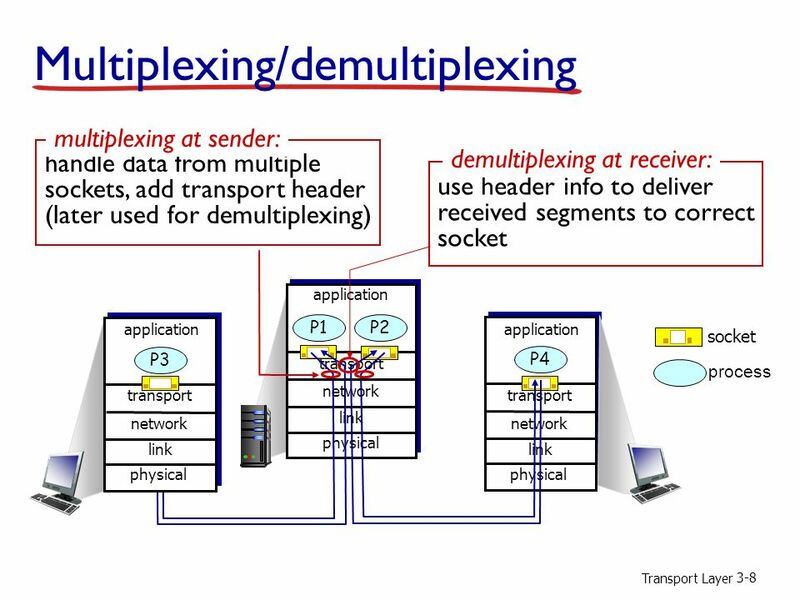 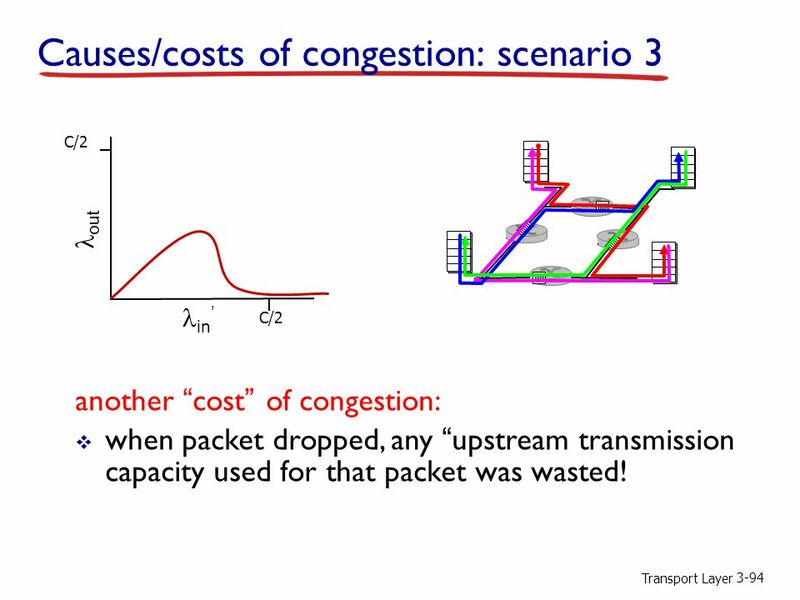 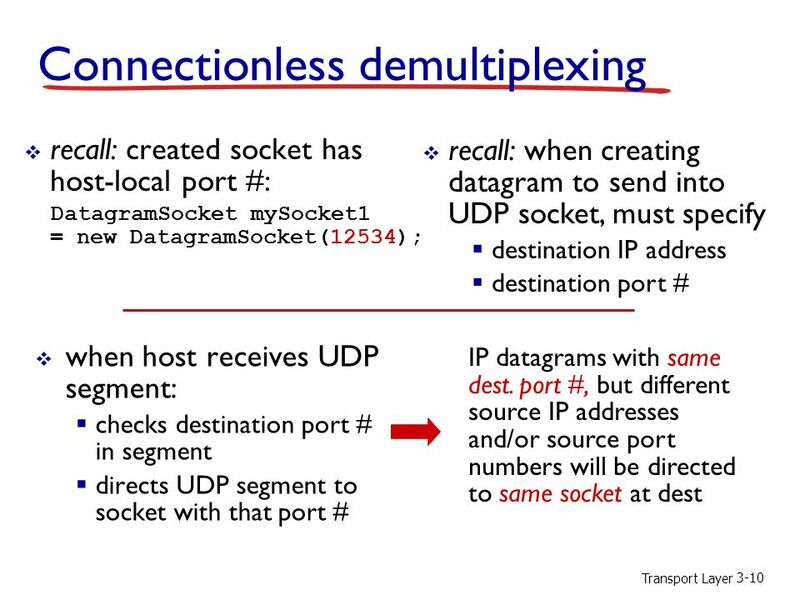 Transport Layer 3-1 Chapter 3 outline 3.1 transport-layer services 3.2 multiplexing and demultiplexing 3.3 connectionless transport: UDP 3.4 principles. 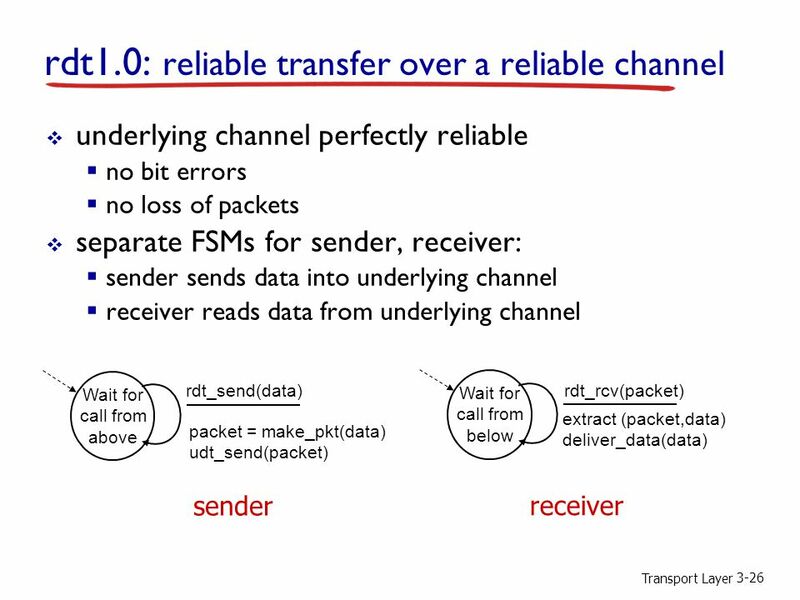 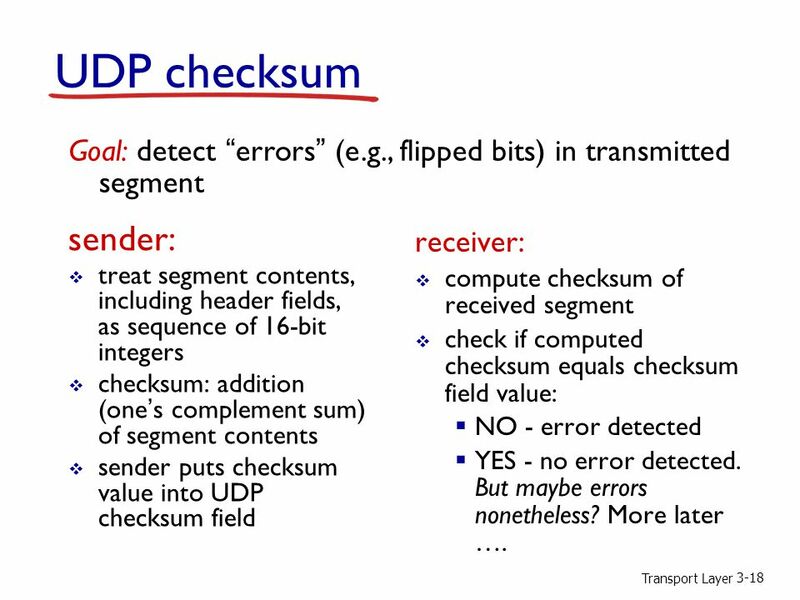 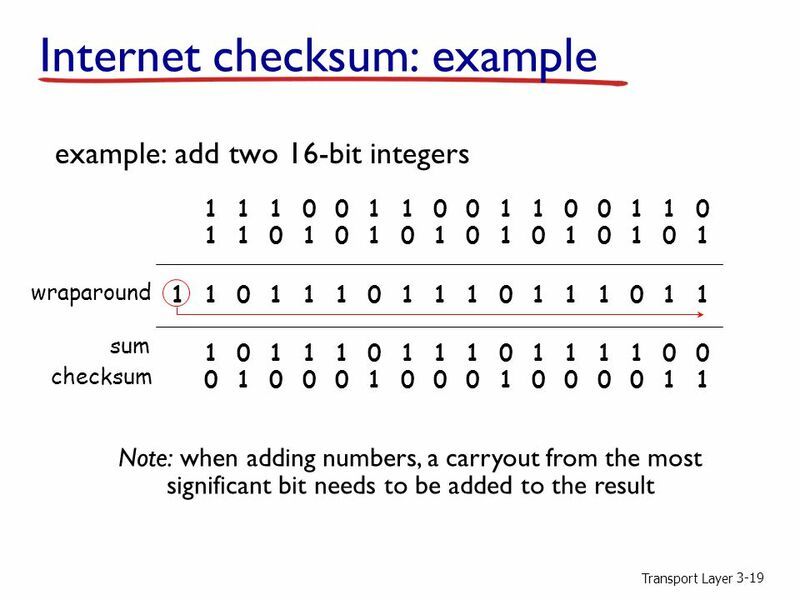 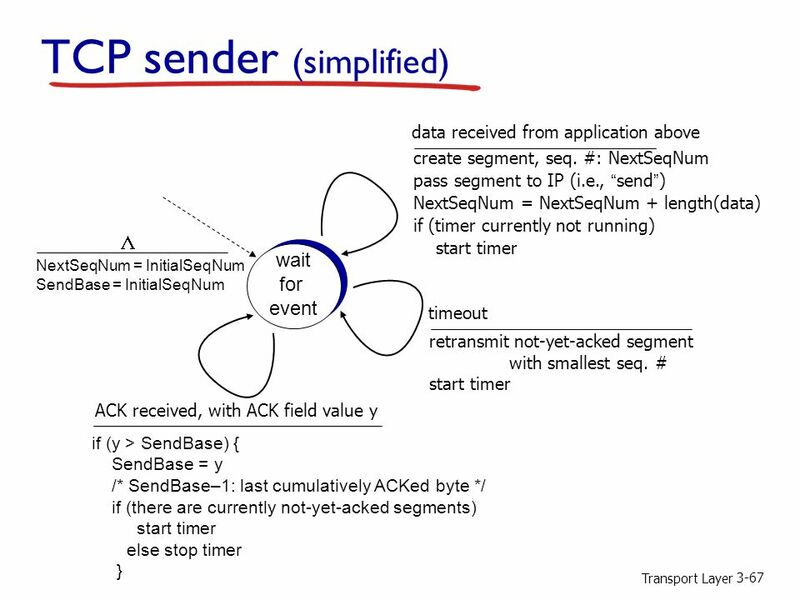 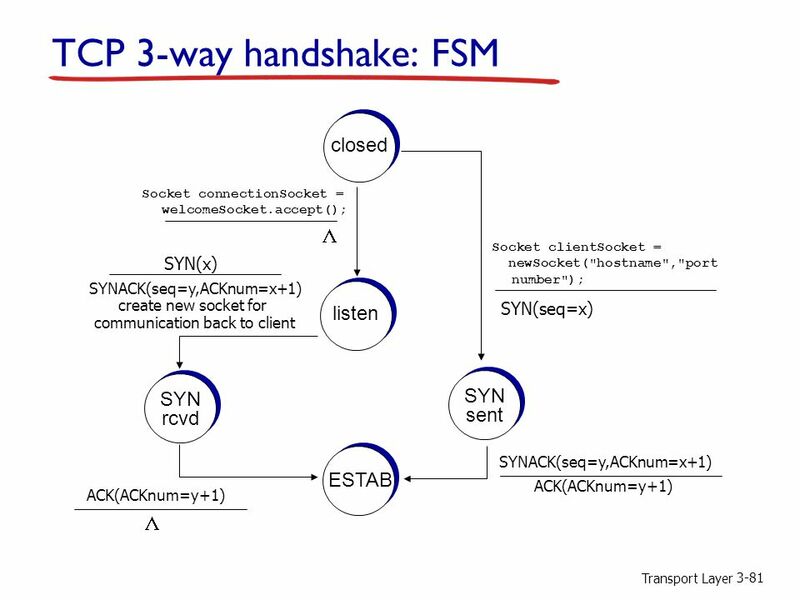 Transport Layer3-1 Summary of Reliable Data Transfer Checksums help us detect errors ACKs and NAKs help us deal with errors If ACK/NAK has errors sender. 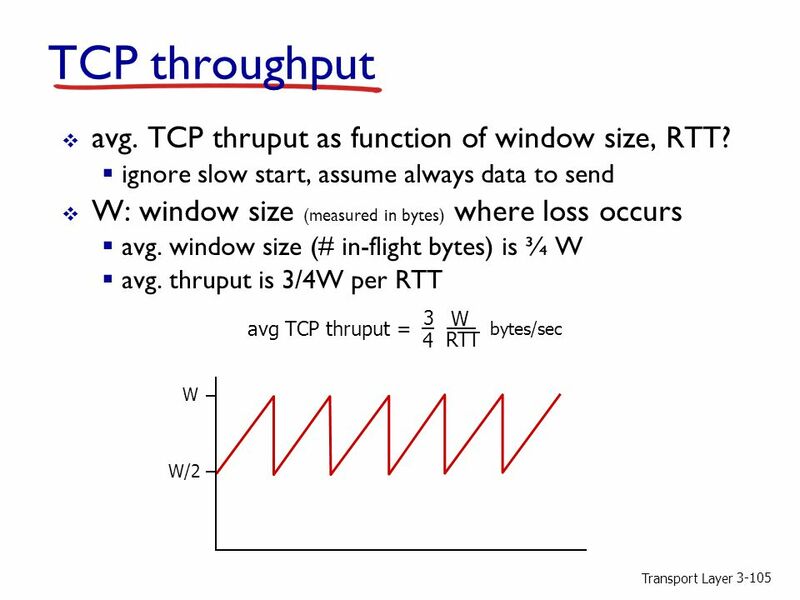 Week 9 TCP9-1 Week 9 TCP 3 outline r 3.5 Connection-oriented transport: TCP m segment structure m reliable data transfer m flow control m connection management. 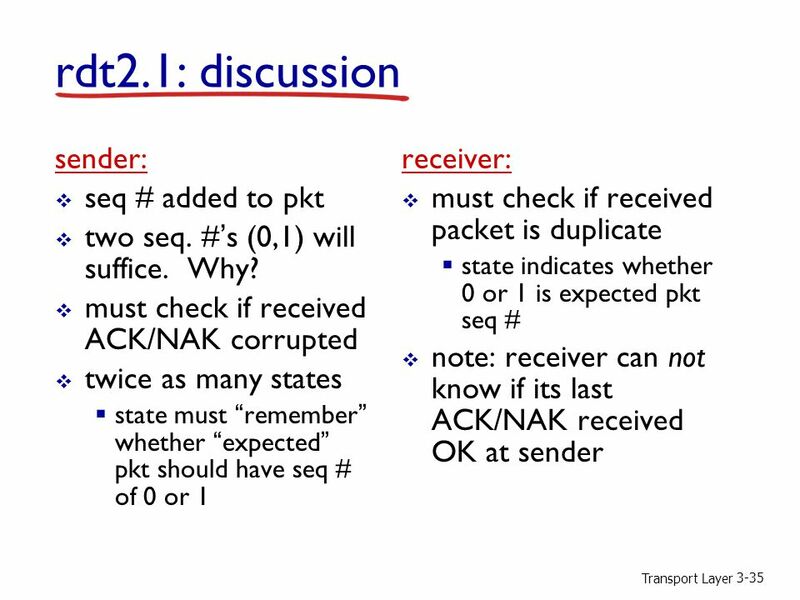 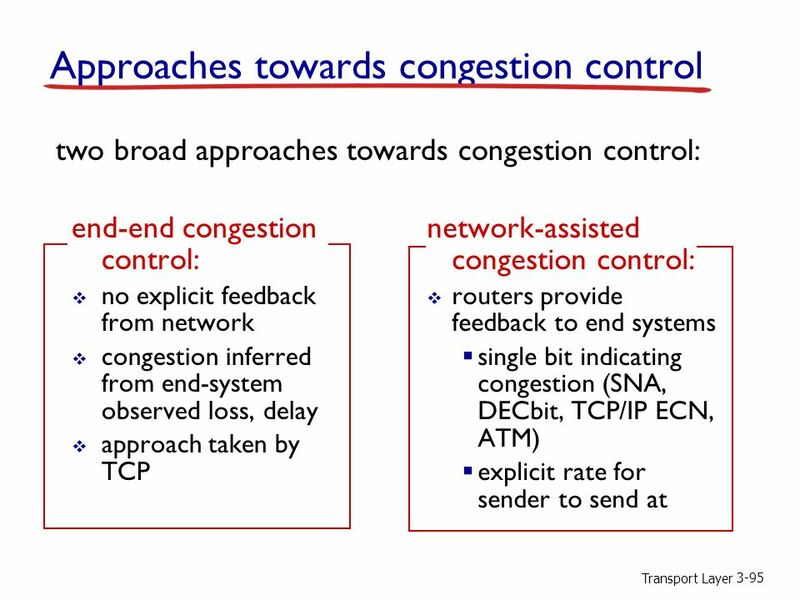 Introduction 1 Lecture 14 Transport Layer (Transmission Control Protocol) slides are modified from J. Kurose & K. Ross University of Nevada – Reno Computer. 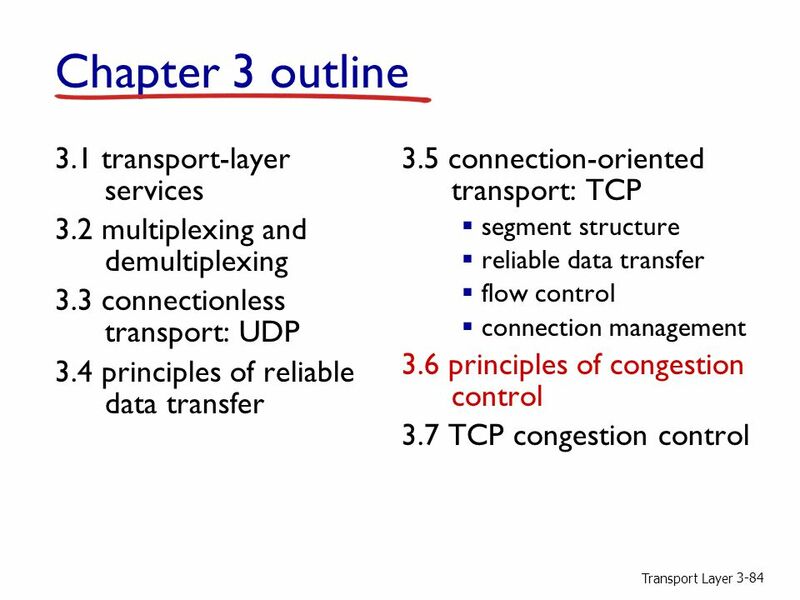 Chapter 3 Transport Layer slides are modified from J. Kurose & K. Ross CPE 400 / 600 Computer Communication Networks Lecture 12. 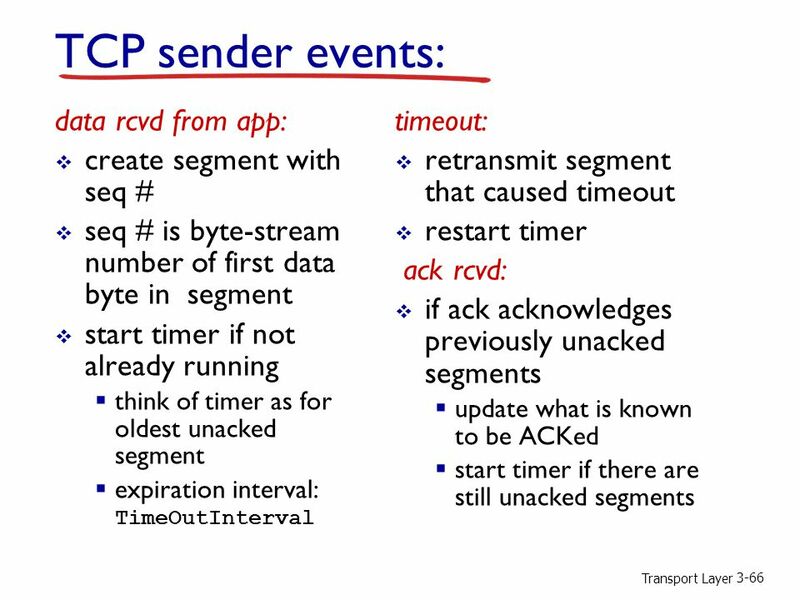 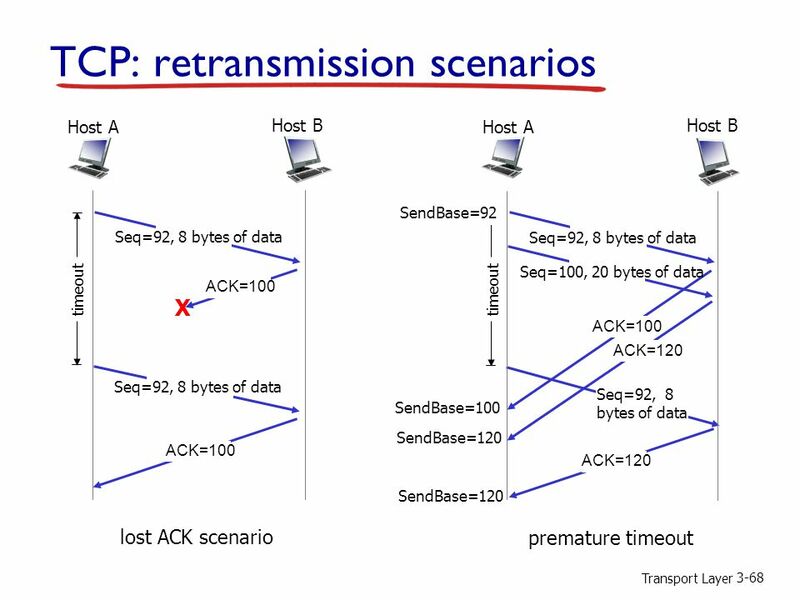 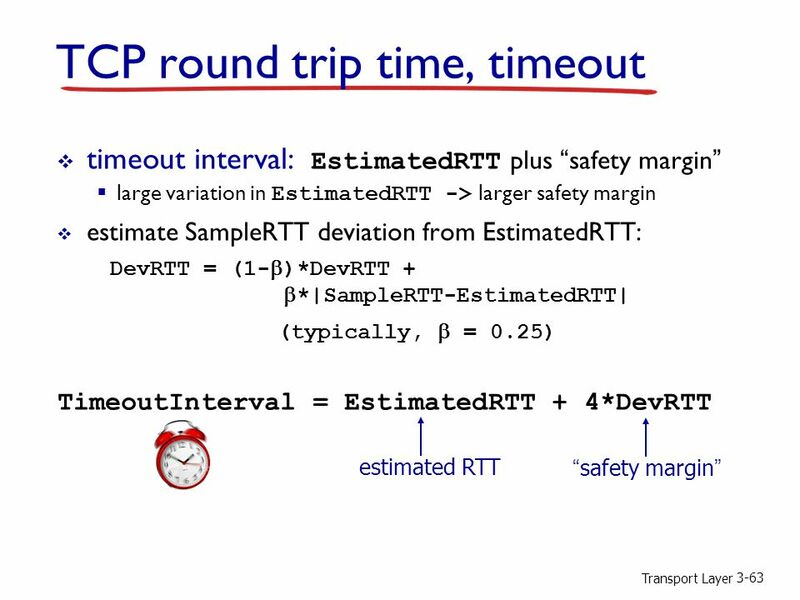 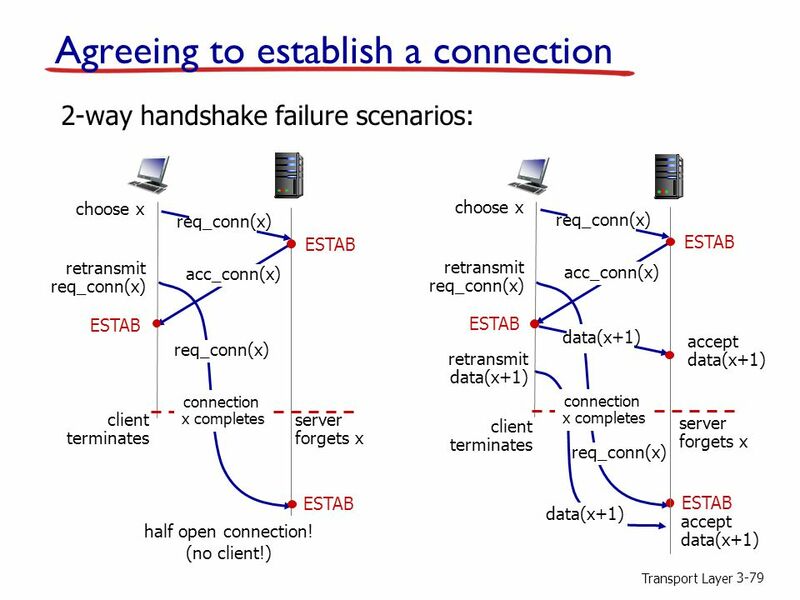 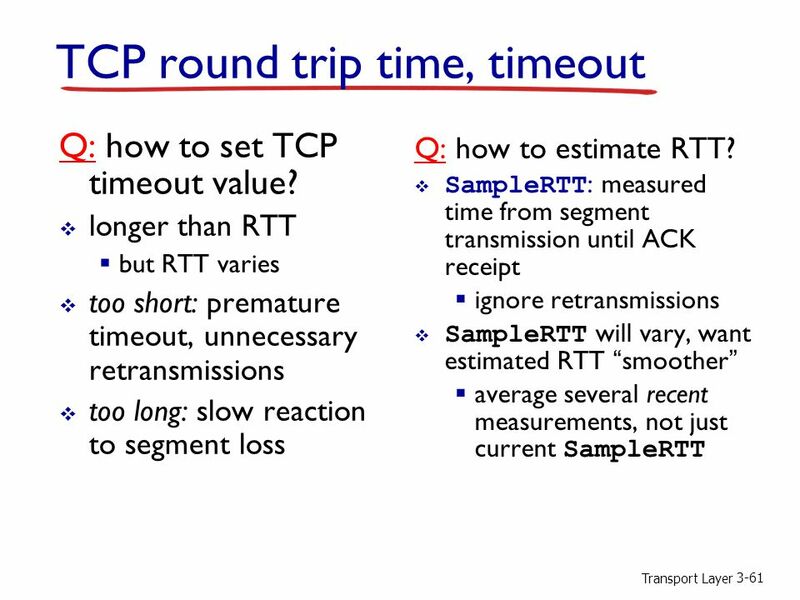 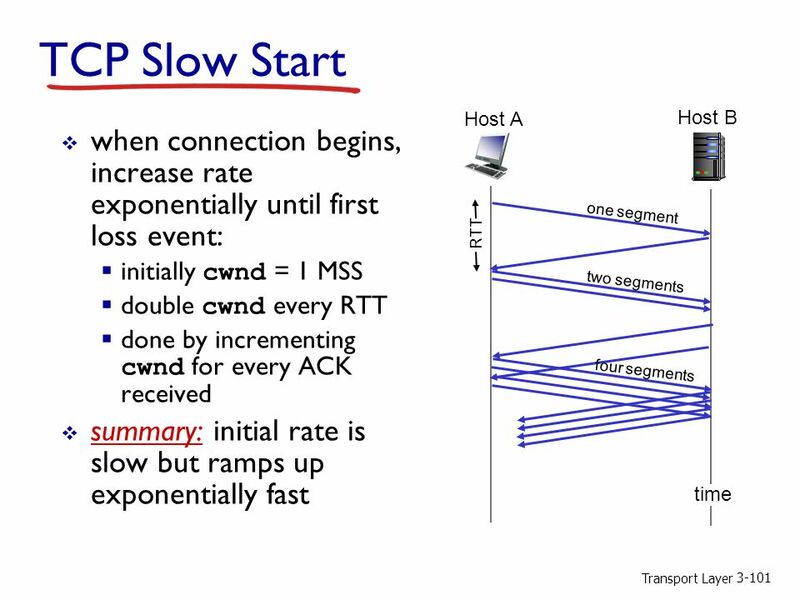 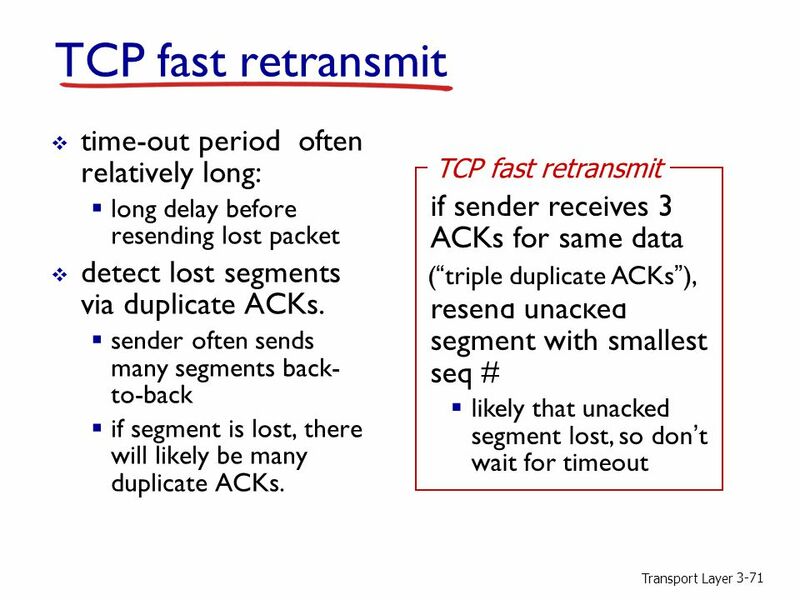 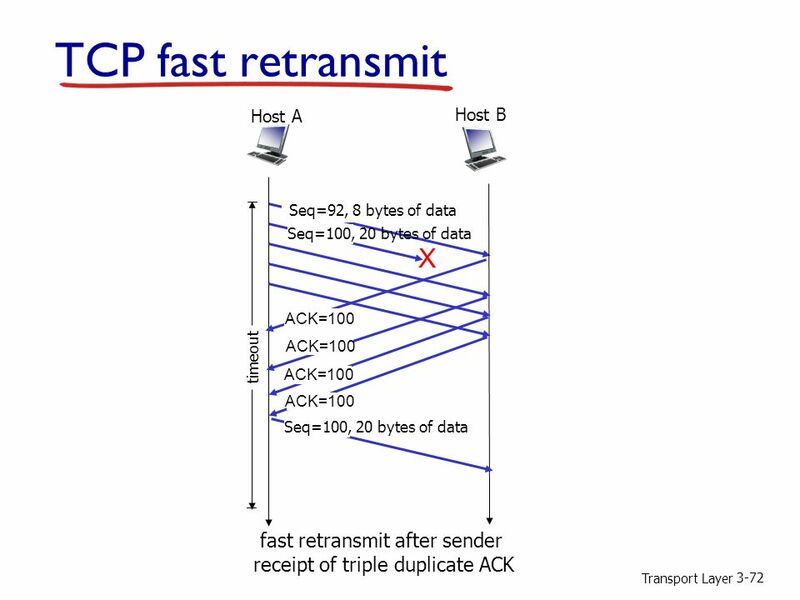 Transport Layer 3-1 Fast Retransmit r time-out period often relatively long: m long delay before resending lost packet r detect lost segments via duplicate. 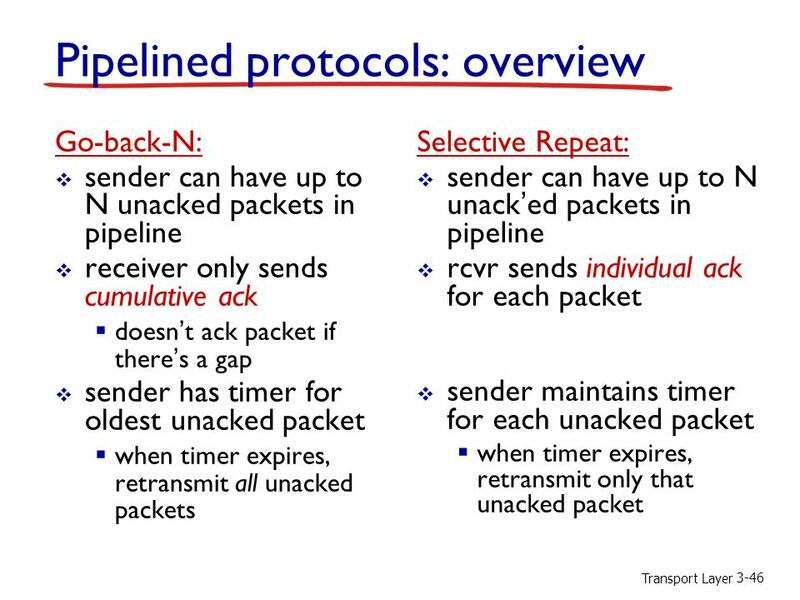 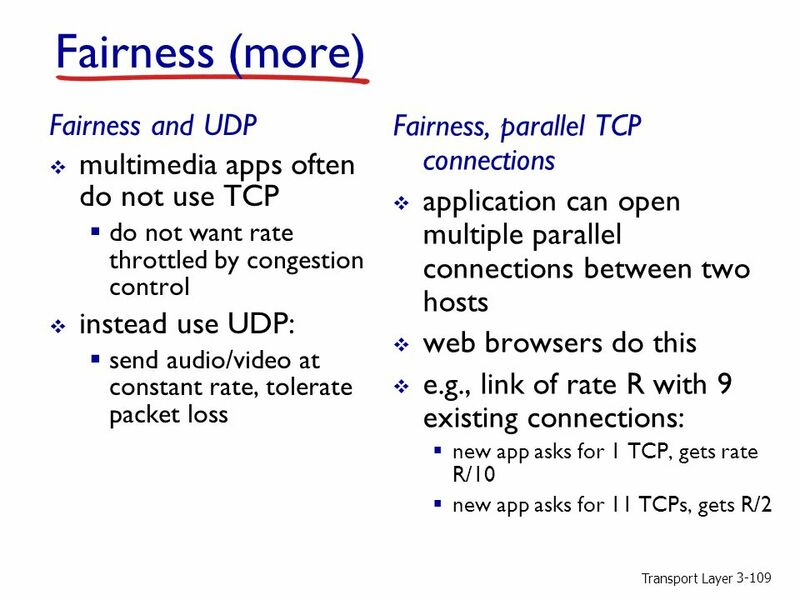 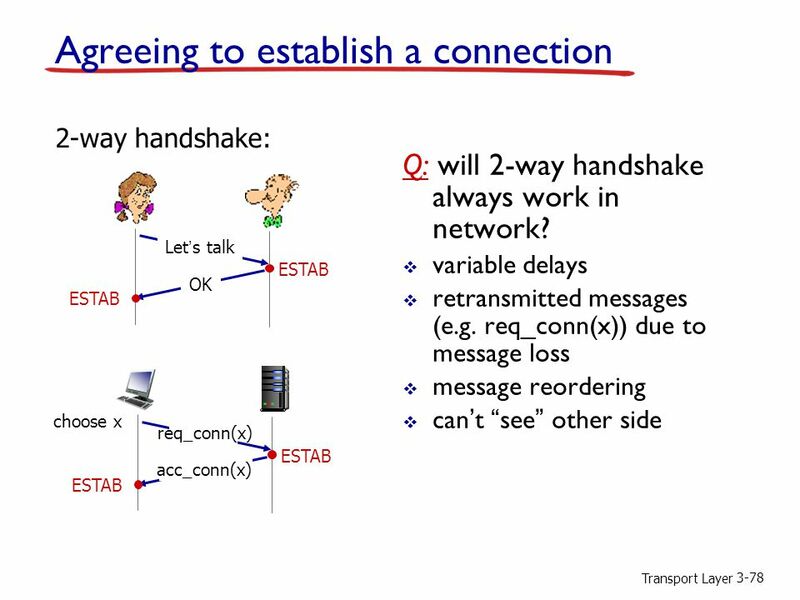 Transport Layer 3-1 Transport Layer r To learn about transport layer protocols in the Internet: m TCP: connection-oriented protocol m Reliability protocol. 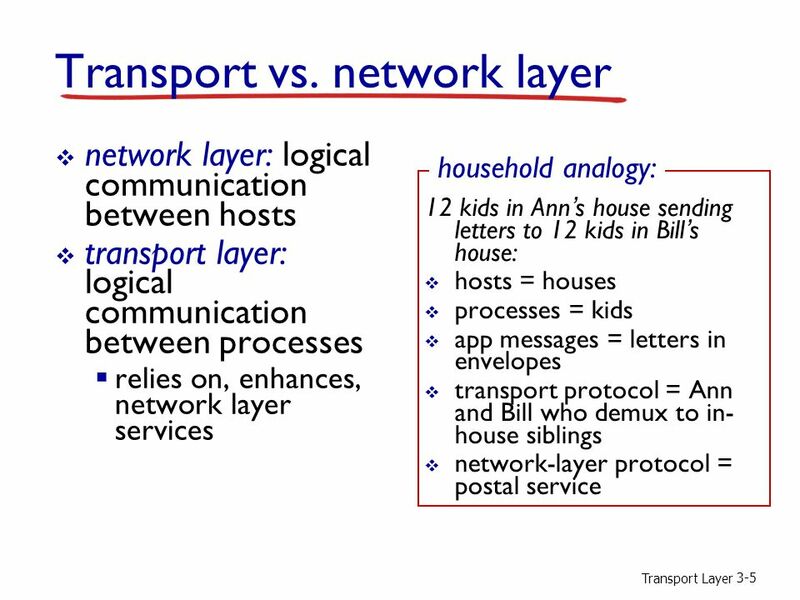 Transport Layer Transport Layer: TCP. 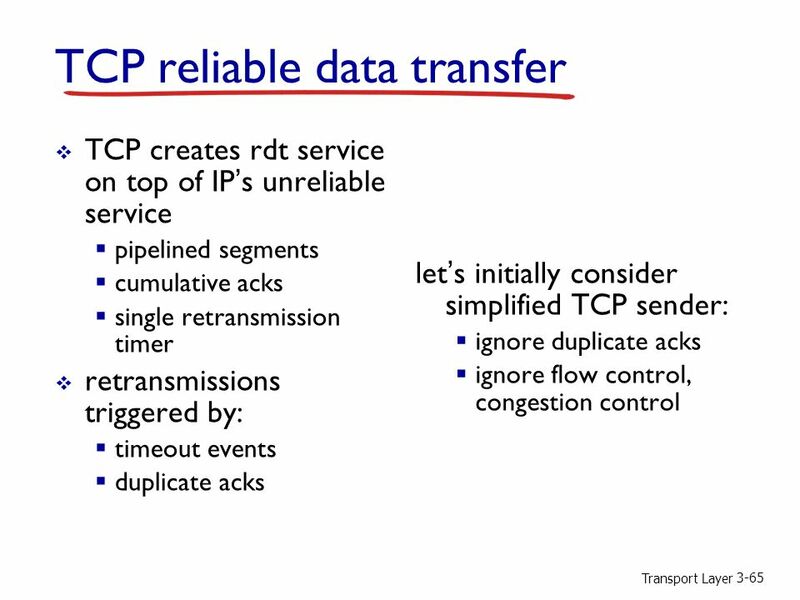 Transport Layer 3-2 TCP: Overview RFCs: 793, 1122, 1323, 2018, 2581 r full duplex data: m bi-directional.